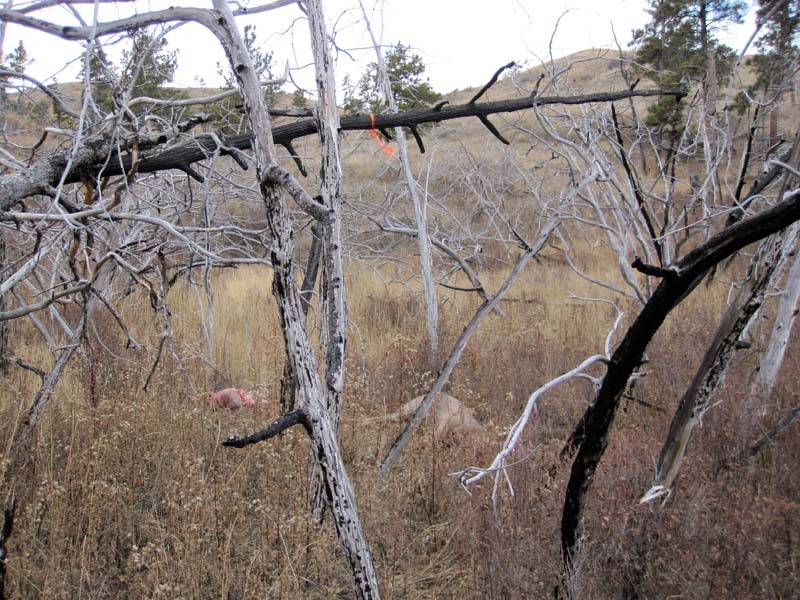 This web page is about a week long deer hunting trip to Fort Peck Reservoir in Eastern Montana. I went with my cousins Chip and Bruce, and a friend Steve Sanders, and my cousin once removed (?) Austin Linder showed up for a few days. Click on any picture for a much larger version. 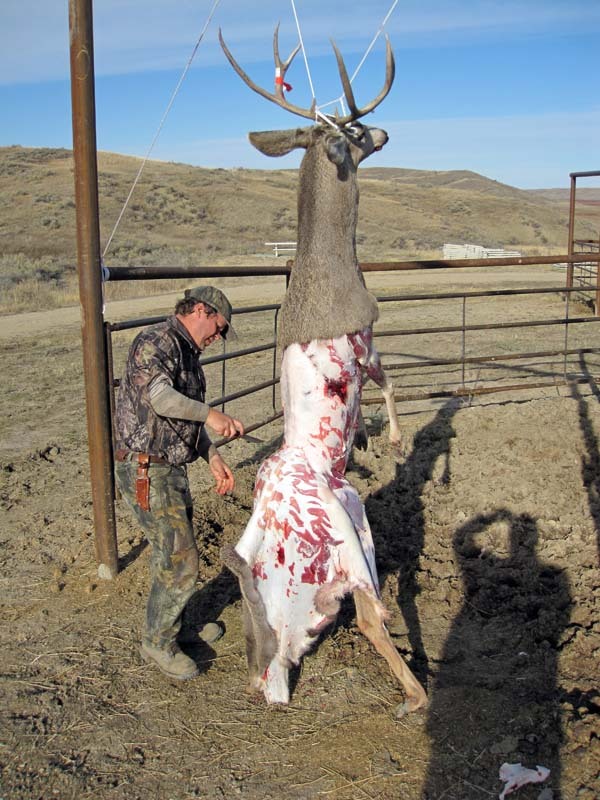 Some of the pictures below depict dead deer being skinned, and as such might bother some people. PLEASE STOP NOW if you are bothered by such pictures. It is not my intention to shock, this is simply how this is done. Our family hunts ethically and legally, we eat the meat from the animals we take, and we use the hides from the animals also. We are never intentionally cruel. 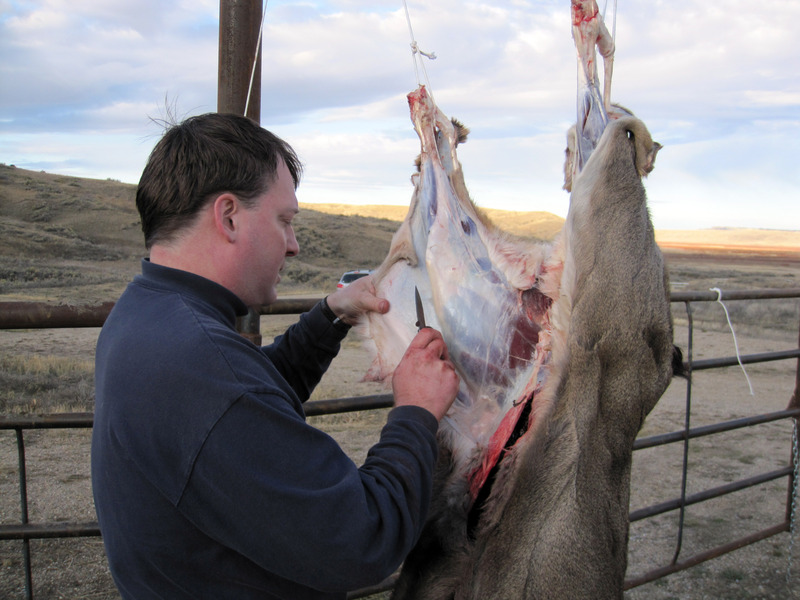 Part of any meat preparation (like the beef or chicken you buy at your local store) is cooling the meat quickly after the animal dies, and an important part of that process is skinning the animal to allow heat to escape so the meat does not spoil and would be wasted. PLEASE STOP READING NOW if you are easily shocked or are offended by this sort of subject matter. I enjoy hunting for a week in Montana every few years, but most of the time I'm a software engineer in Silicon Valley, California. As such, I like to bring electronics along to make the trip safer and more fun. :-) I'm a little worried I went overboard this time, below is a picture before I left of some of the things I'm bringing. 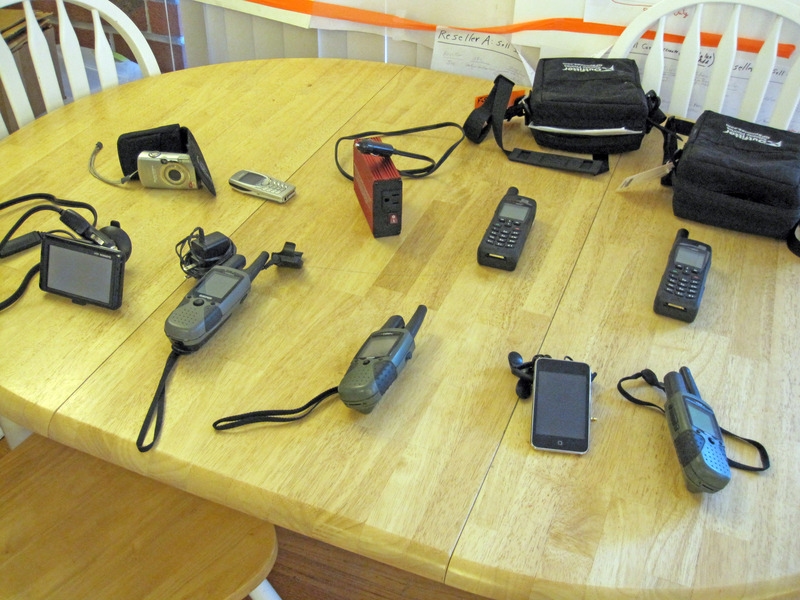 That's 4 GPS units (some are for the other hunters on the trip to borrow), an iPod touch, a digital camera, a cell phone, two Iridium satellite phones (no cell coverage where we hunt, and it's 50 miles to the nearest town), and a DC to AC converter to allow me to charge all these toys from the cigarette lighter outlet in my rental SUV. 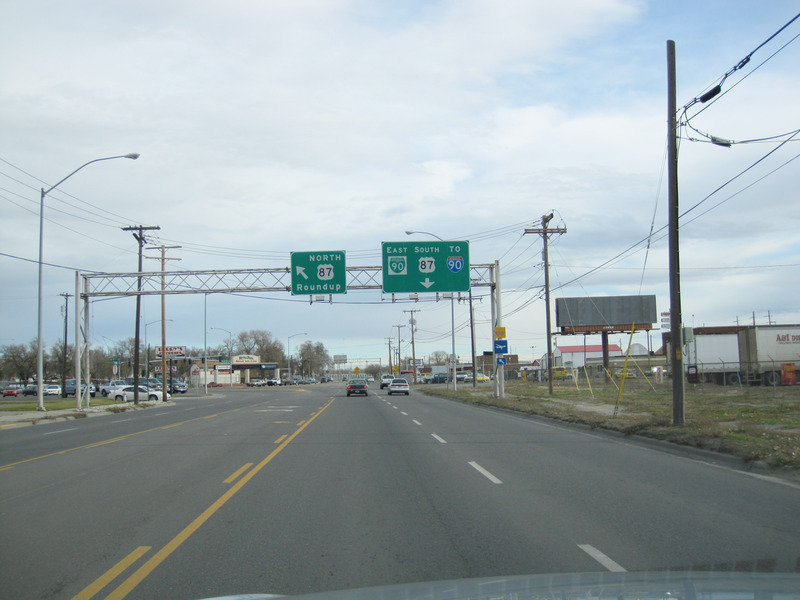 I flew into Billings, Montana at 11pm on Friday, October 30th, 2009. The next morning I dropped by the Cabela's sporting goods store in Billings to pick up a few supplies for the trip. 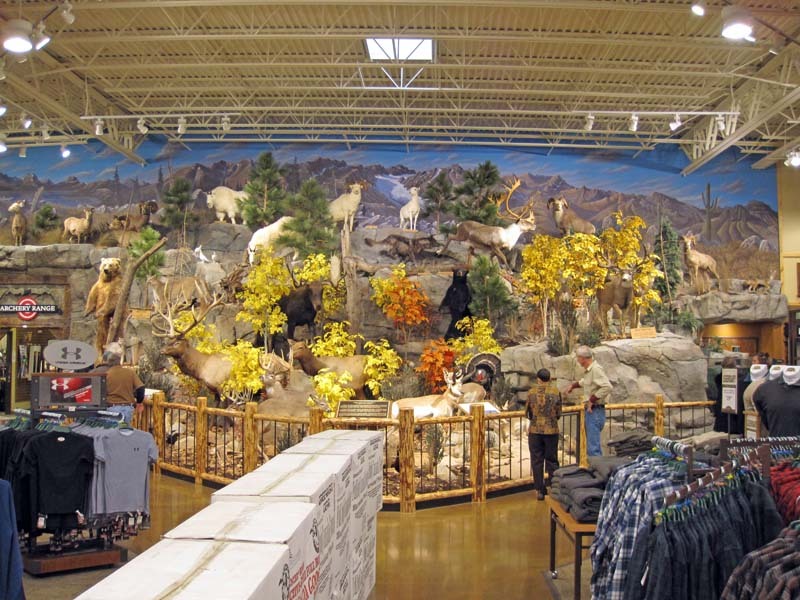 Below is a picture of this HUGE store from the outside. 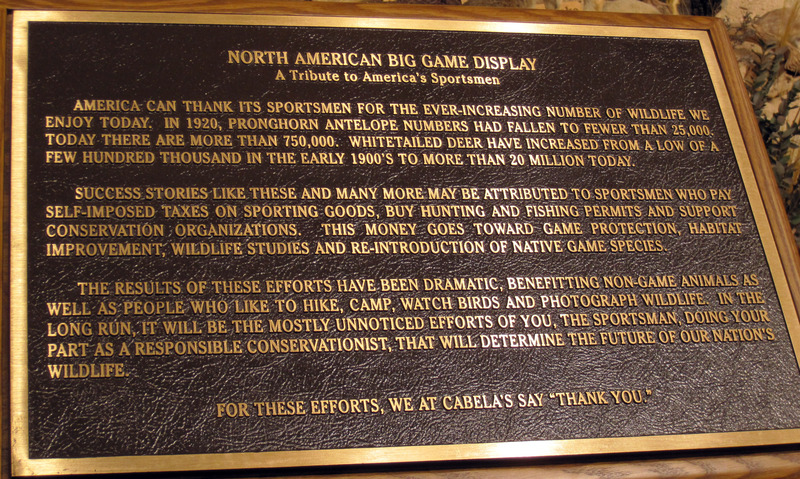 In the center of the Cabela's there is a "North American Big Game Display - A Tribute to America's Sportsmen". Below is a close up of the plaque describing the display. 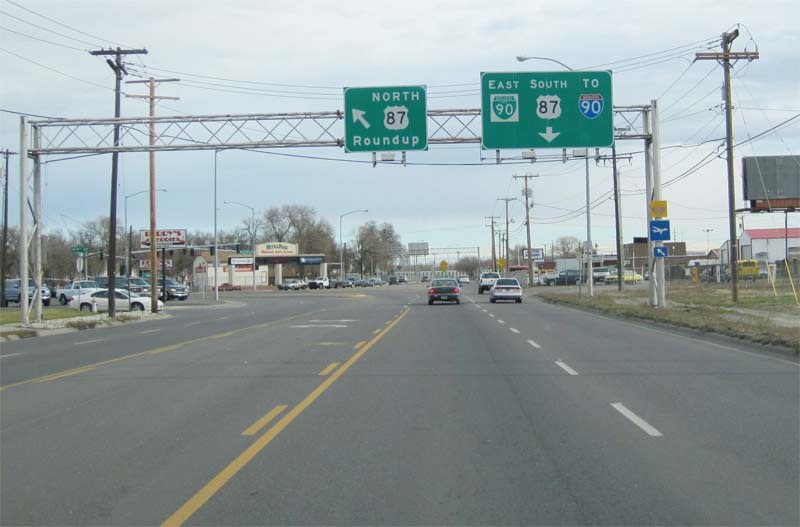 After loading up on the last supplies, I head north out of Billings Montana on highway 87 towards Roundup. 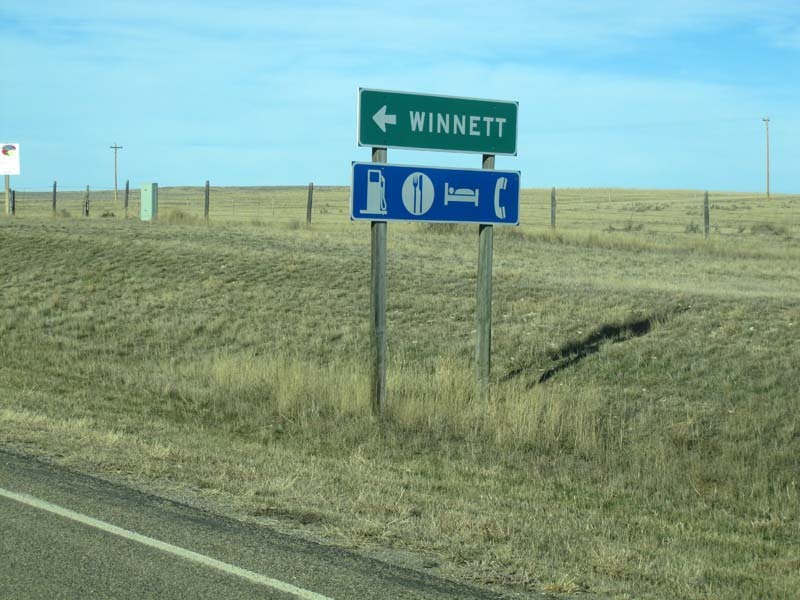 I'm headed to meet up with my cousins at a small town called Winnett, Montana, which is the last civilization we'll see. 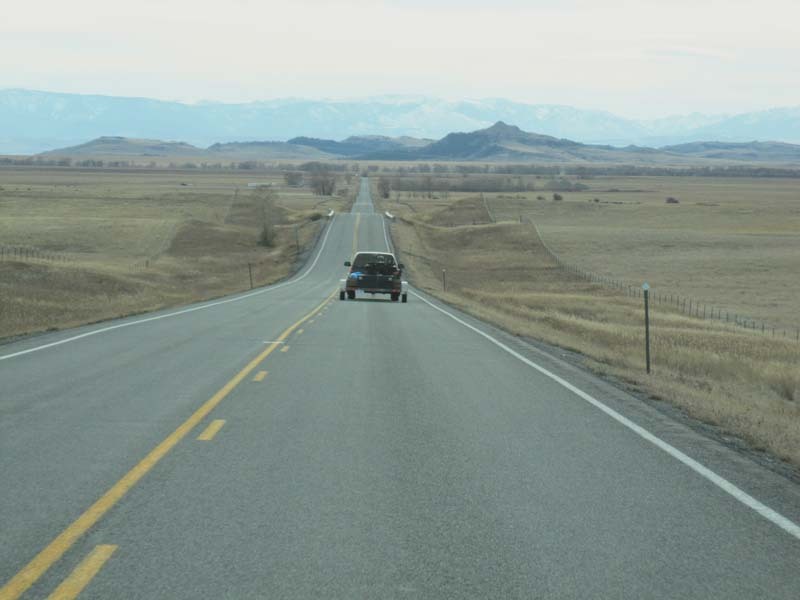 Rush hour in eastern Montana. 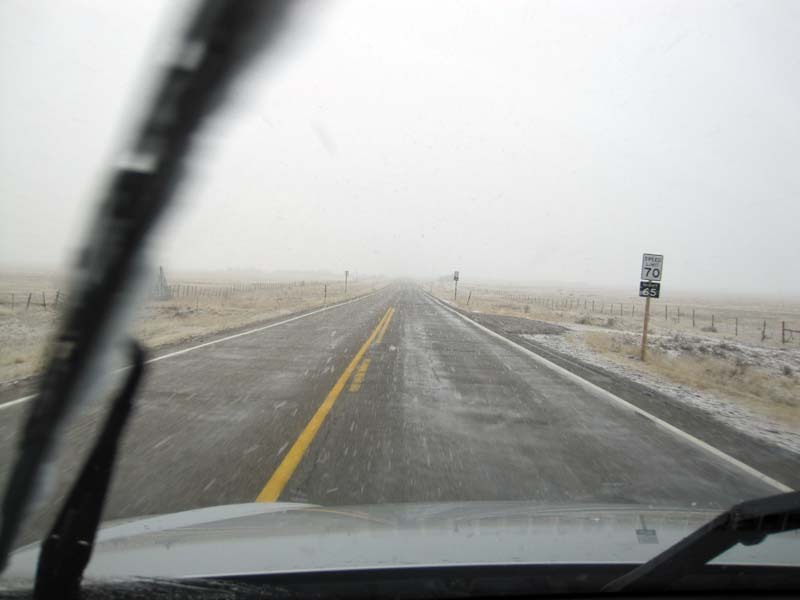 I'm heading north on highway 87 out of Billings, and there isn't another car as far as the eye can see. 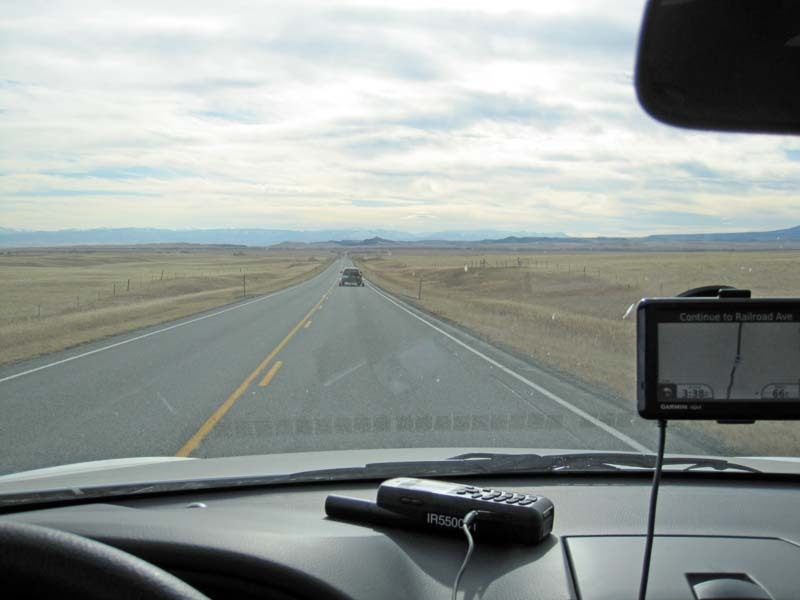 That's my Iridium satellite phone on the dash of my rental SUV -> no cell phone coverage out here. Winnett Montana is a small town, but it has a restaurant called Kozy Korner and a 24 hour credit card operated (unmanned) gas pump. 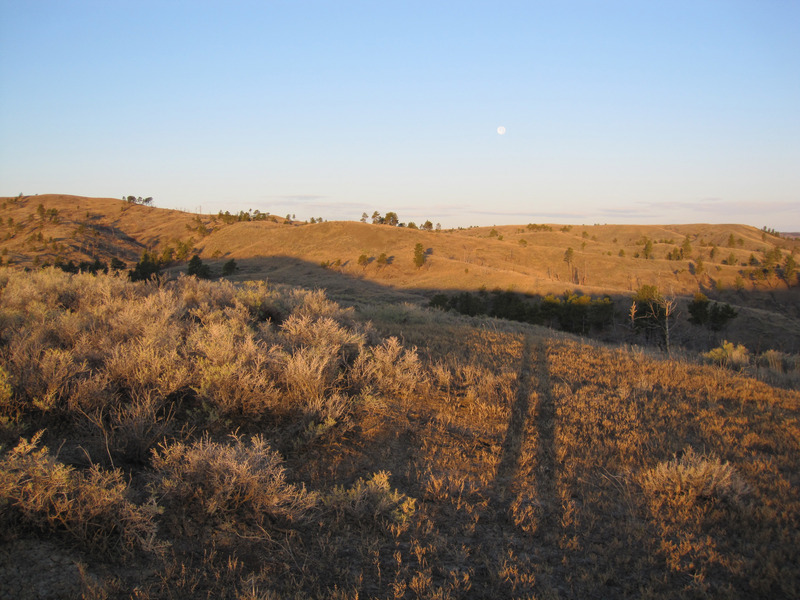 It is the closest civilization to where we will be hunting at Crooked Creek Campground at Fort Peck Reservoir, Montana. These are the last paved roads, from here it is 50 miles of gravel roads to the camp. 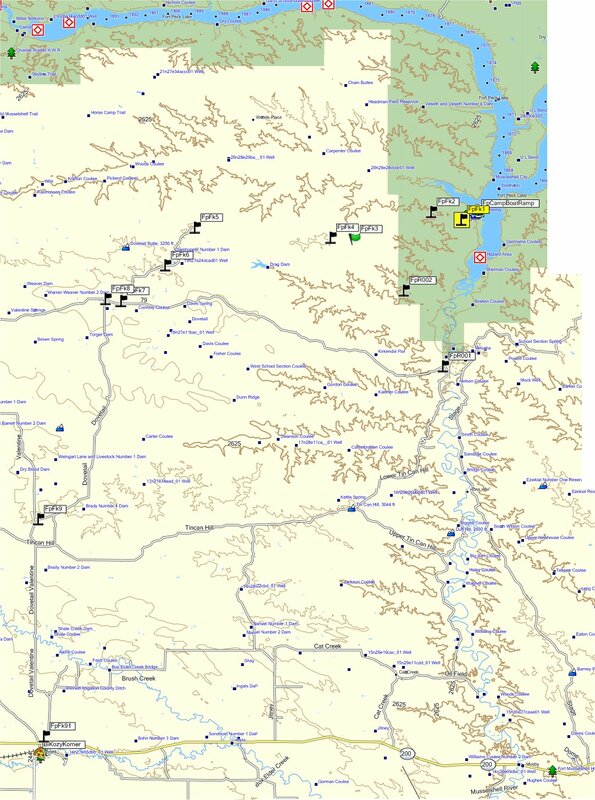 Here is a very generic map showing the location of Fort Peck Reservoir in Montana. 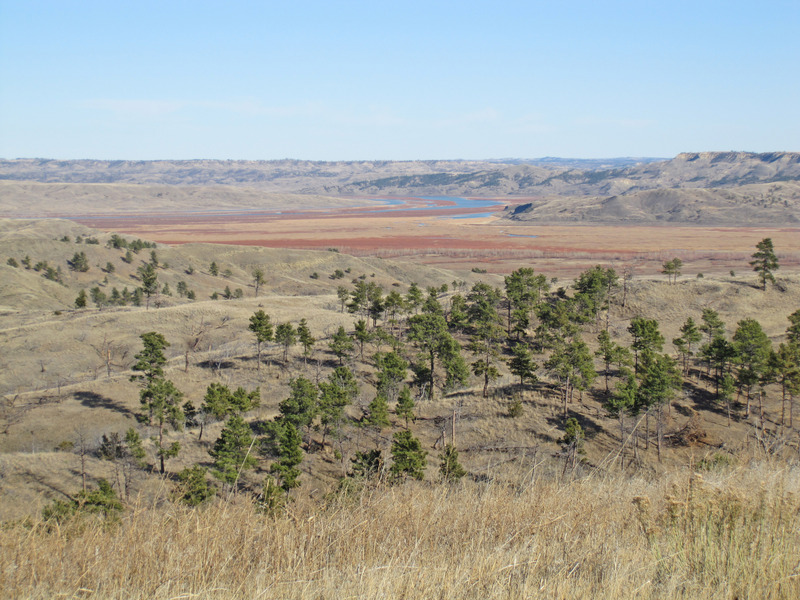 The reservoir is the fifth largest man-made lake in the U.S. and is a 134 mile long lake, but has over 1,500 miles of coastline because of the number of tributaries and rugged coastline. See some references here1 and here2. 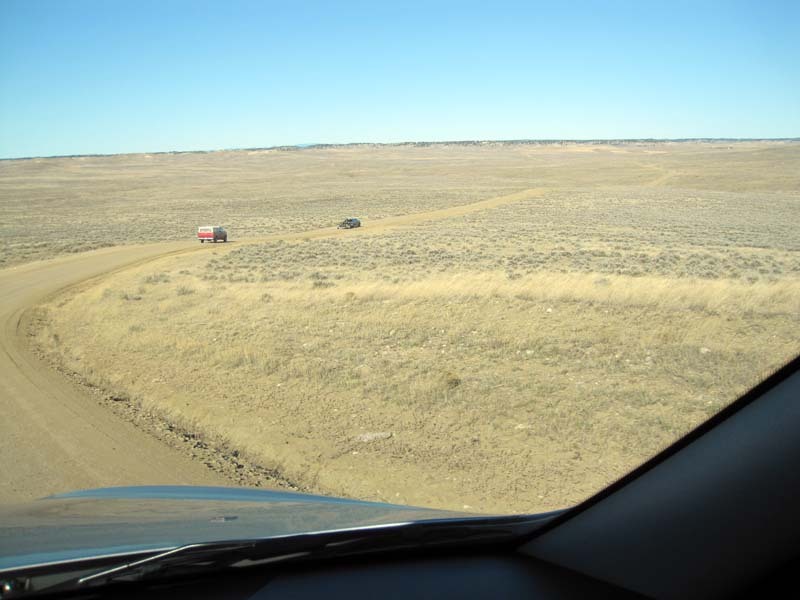 I meet up with my cousins, and here we are caravanning across eastern Montana towards Fort Peck Reservoir on the gravel roads. It's 50 miles like this to get to the hunting grounds. 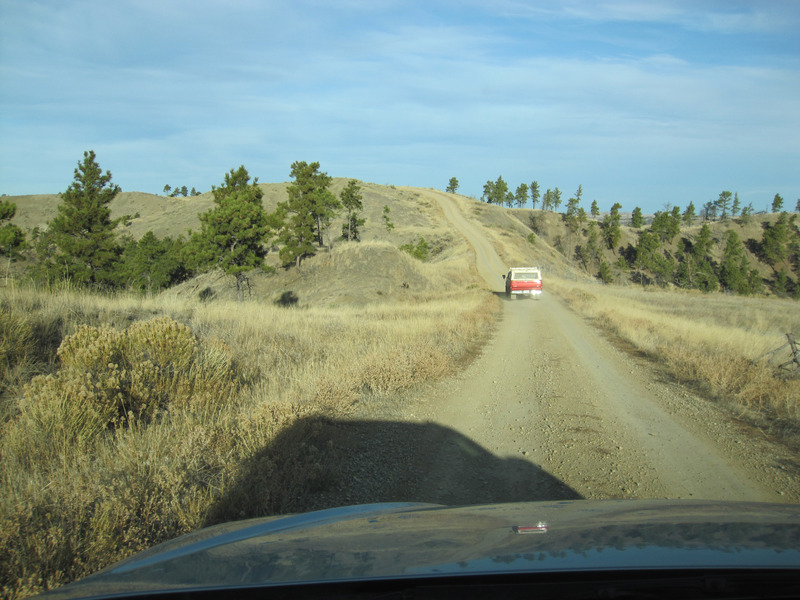 Below is a road map from Winnett to the Crooked Creek Campsite at Fort Peck, Montana. 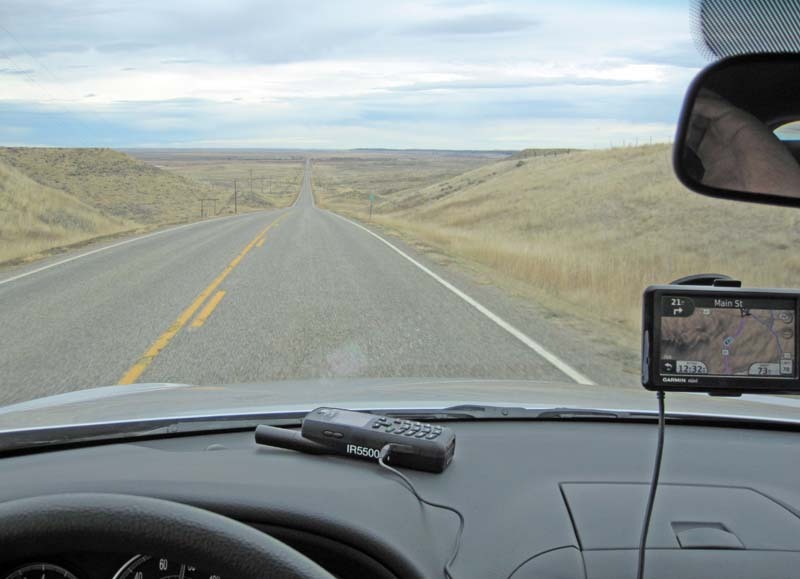 The flags on the map below are GPS waypoints I entered on the dirt roads to make sure I knew which way to go. 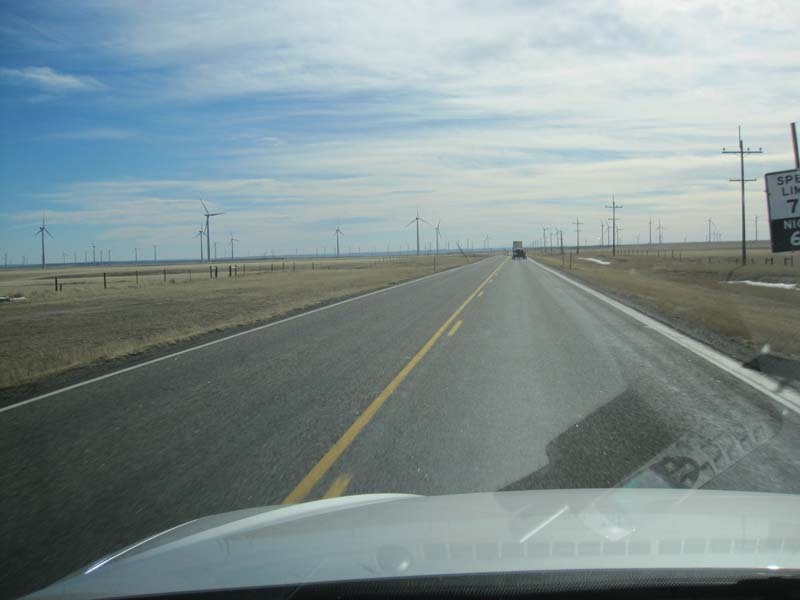 The roads are well marked and VERY well maintained, you could easily drive a regular compact car out there. 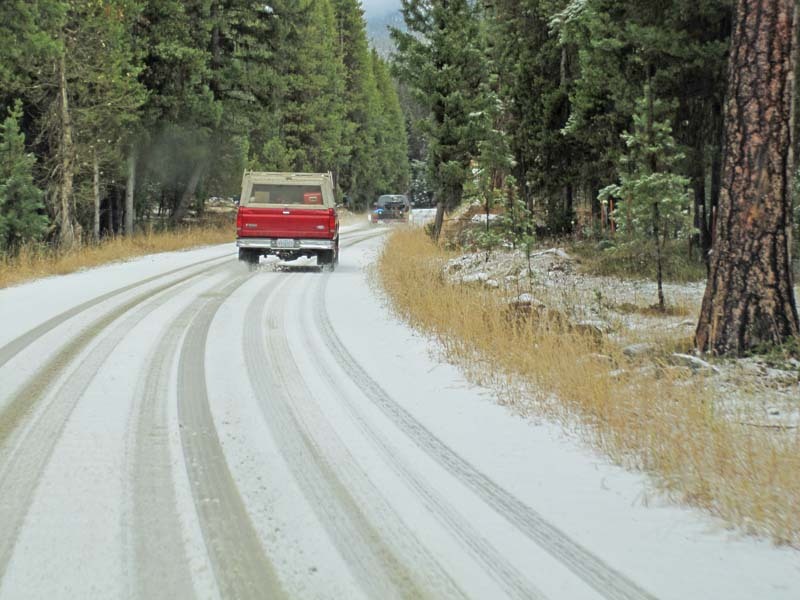 You don't need a 4-wheel drive. 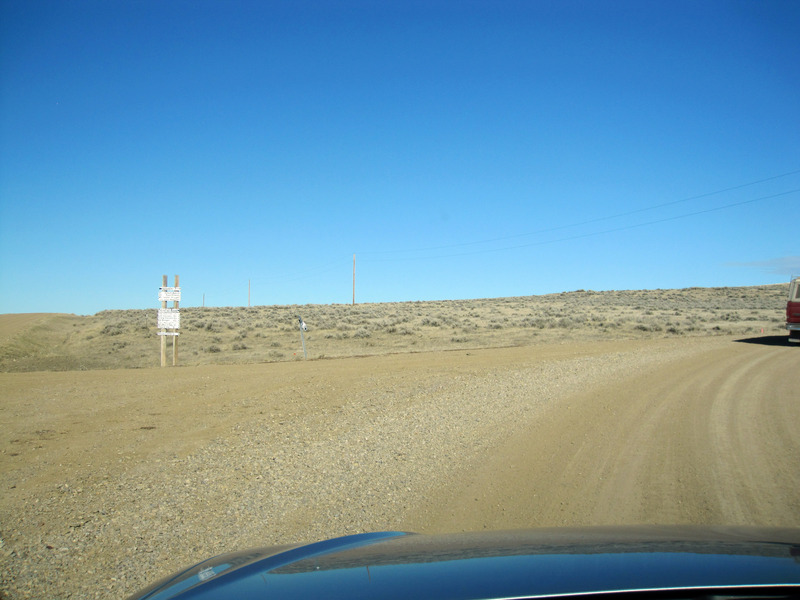 But everything on the map below north of "Kozy Corner" (which is in the town of Winnett, Montana) is gravel and dirt. 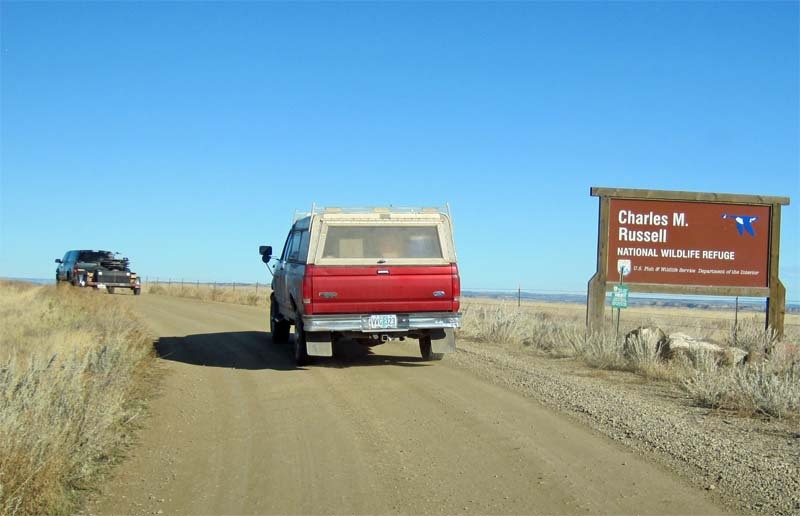 Here we head into the Charles M. Russell National Wildlife Refuge where we will be hunting. Charles M. Russell is a famous Western painter, usually of cowboys, Indians, and landscapes. 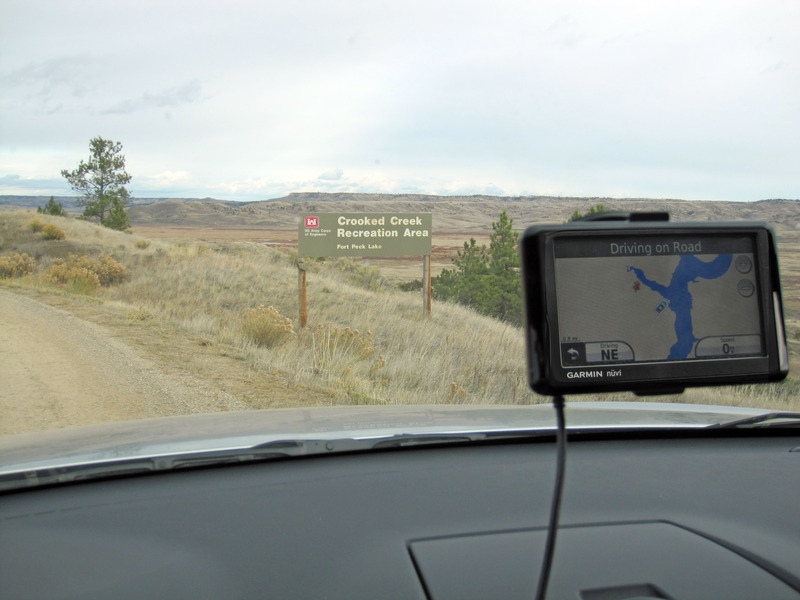 You can see from the GPS we're coming up on the actual Fort Peck Reservoir, and the Crooked Creek Recreation Area is right up against the reservoir. 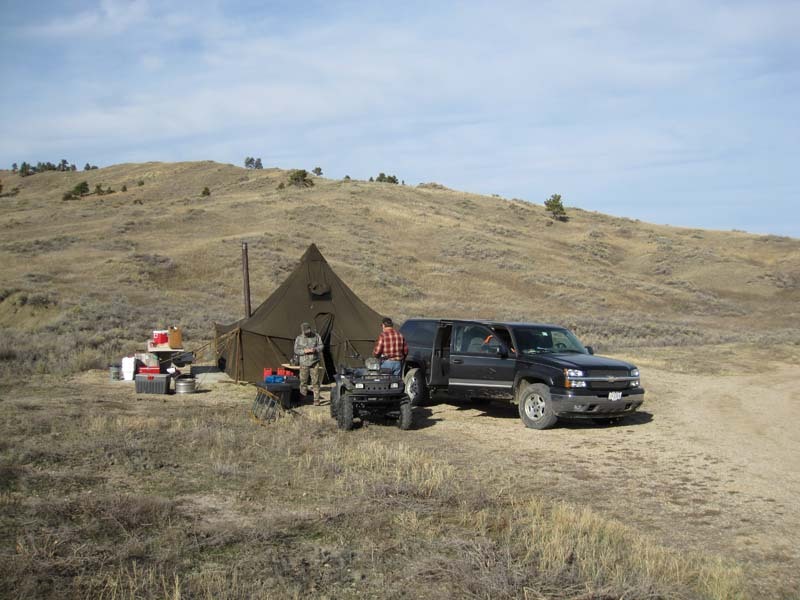 Below you can see our camp almost fully setup. It is Saturday, October 31st, 2009. As the sun goes down, a picture of the Crooked Creek Campground. 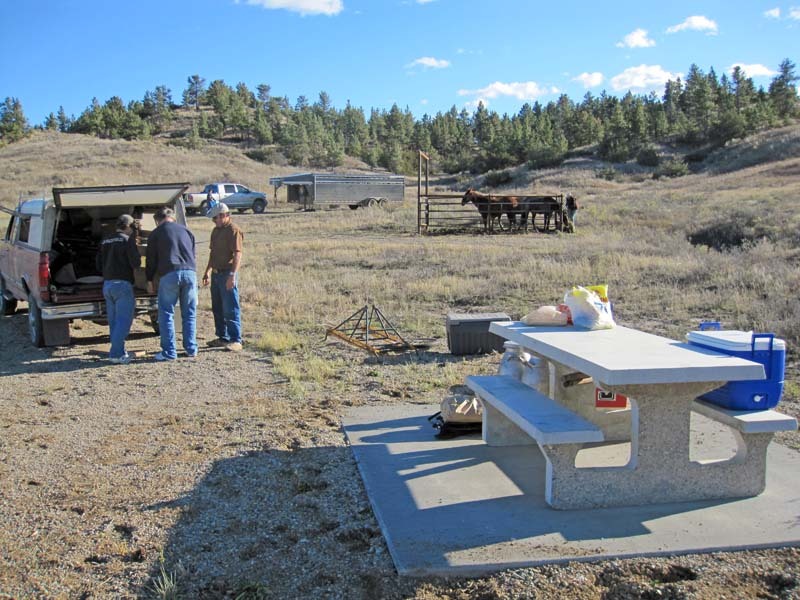 You can see the outhouse through the horse corral just in front of the silver SUV. 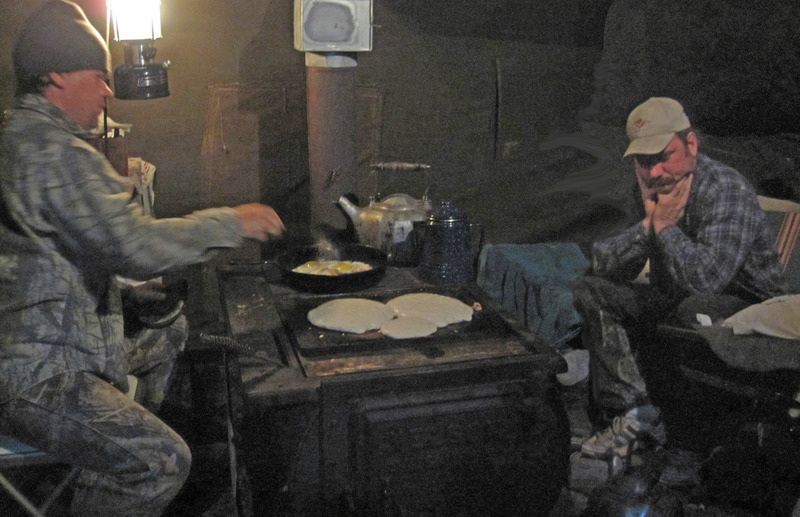 The next morning we get up at 4:30am (the sun rises at about 7am) and start cooking our traditional hunting breakfast of bacon, eggs, and pancakes. That's Chip (Ralph Wilson the 3rd) standing on the far left, and Steve Sanders sitting down. 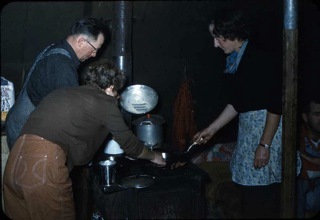 The stove in the center of the tent is a wood stove that produces nice heat and a cooking surface. The tent, stove, and a lot of the cabinets inside the tent were all setup over 30 years ago by my grandfather (Ralph Wilson the 1st). 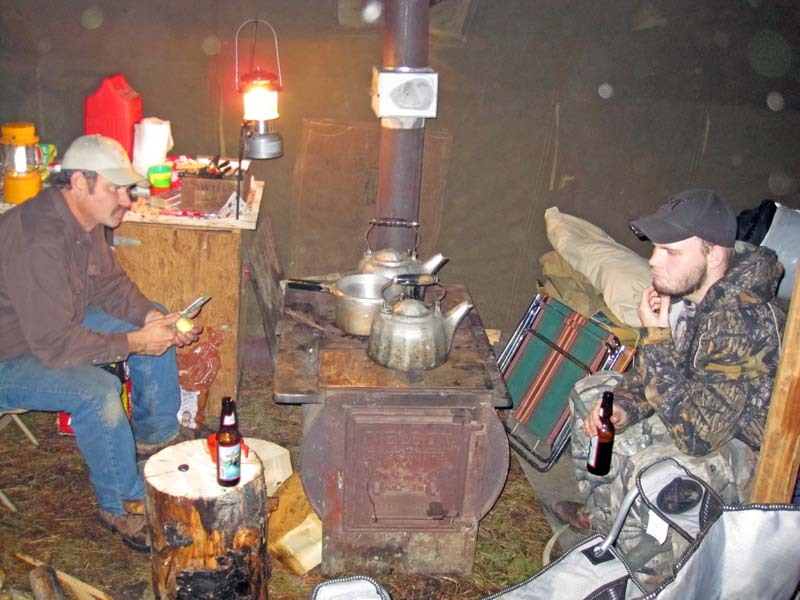 His great grandson came later to Elk camp (Austin Linder, see below). I took the picture below out of the front of my rental SUV driving a few miles down the road before sunrise to start hunting. I'm following Chip, but stop earlier than he does to start out hunting. 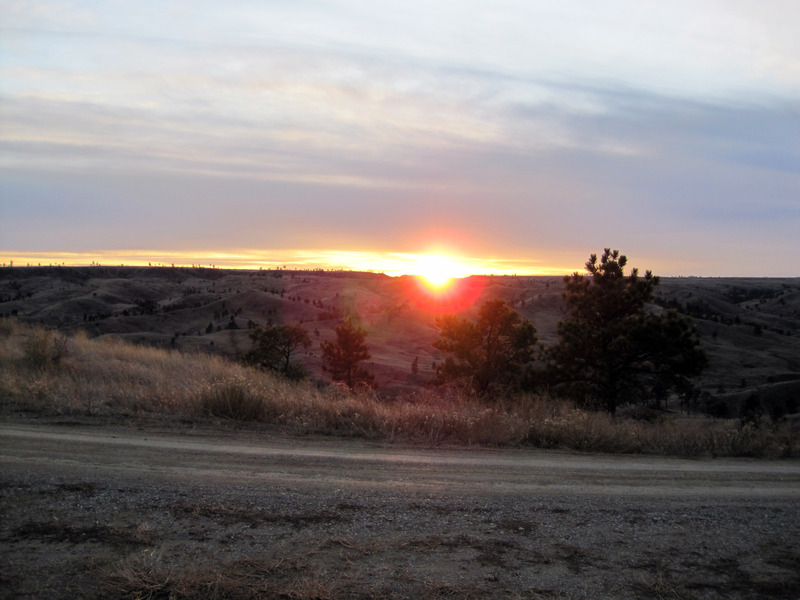 Below is sunrise at about 7am on Sunday, November 1st, 2009. Here I take a last picture before walking a 6 hour loop ending back in this same spot. That's my backpack and hunting rifle. 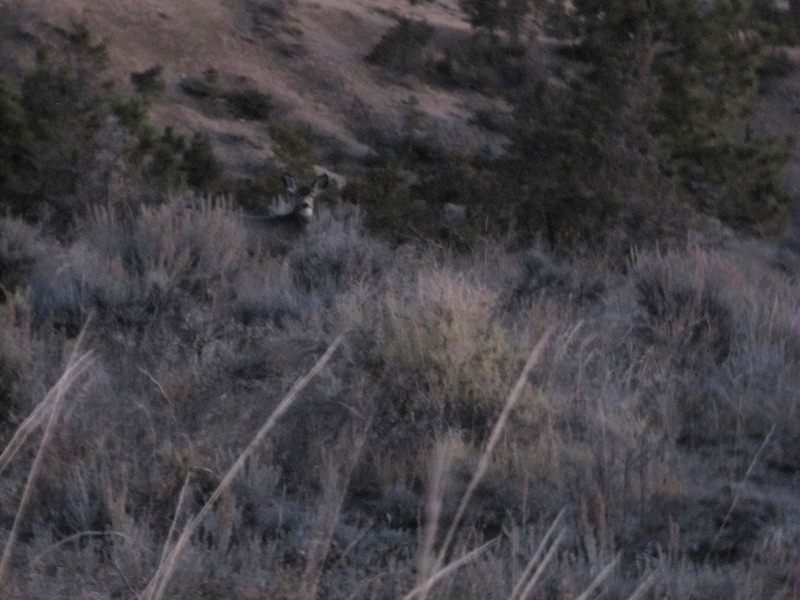 Below is the GORGEOUS hunt I walked. It's just perfect -> nice game trails, gladed nicely, reasonable visibility but not too much so I can surprise the game. 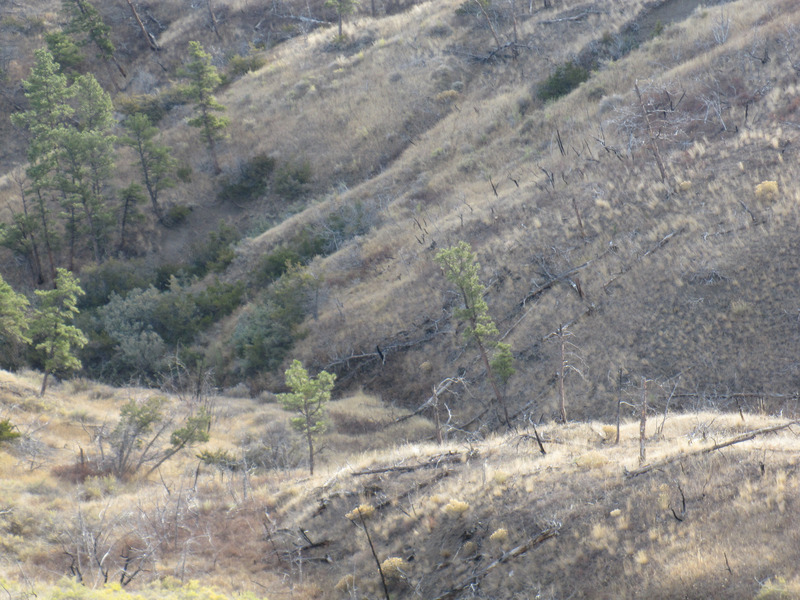 Here I am walking along the bottom between two hills along a game trail. A few minutes after this a buck (male deer) ran out in front of me. 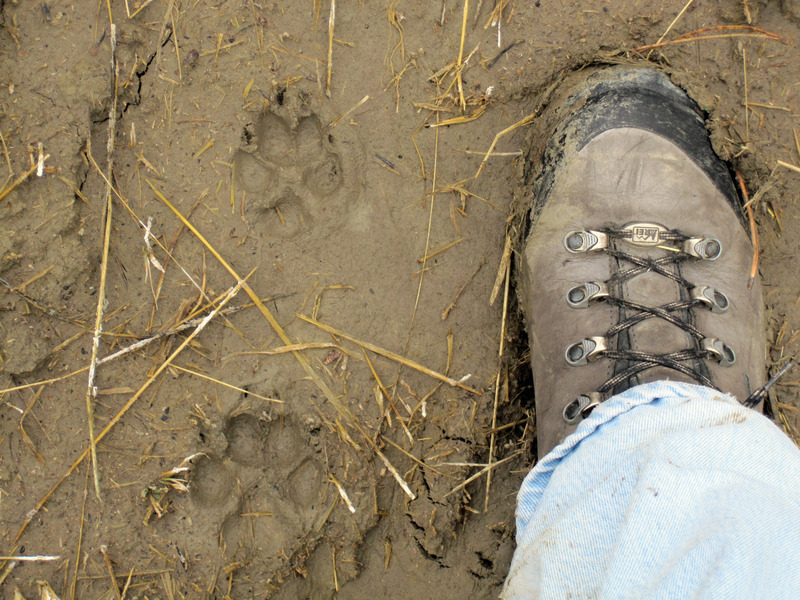 I think these are coyote tracks. We hear them wailing and barking every night. I didn't see any during the day, but some of my cousins saw them. 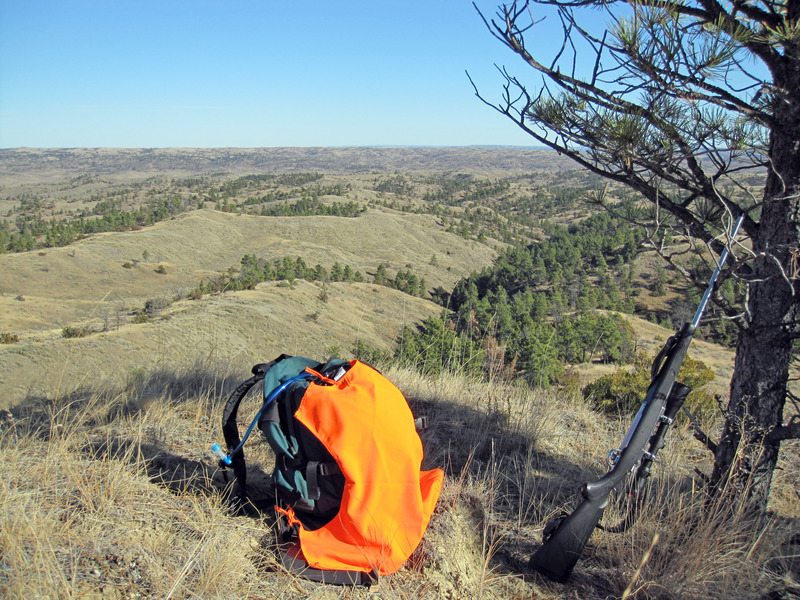 Below I take a break for lunch on a ridge overlooking a pretty valley. 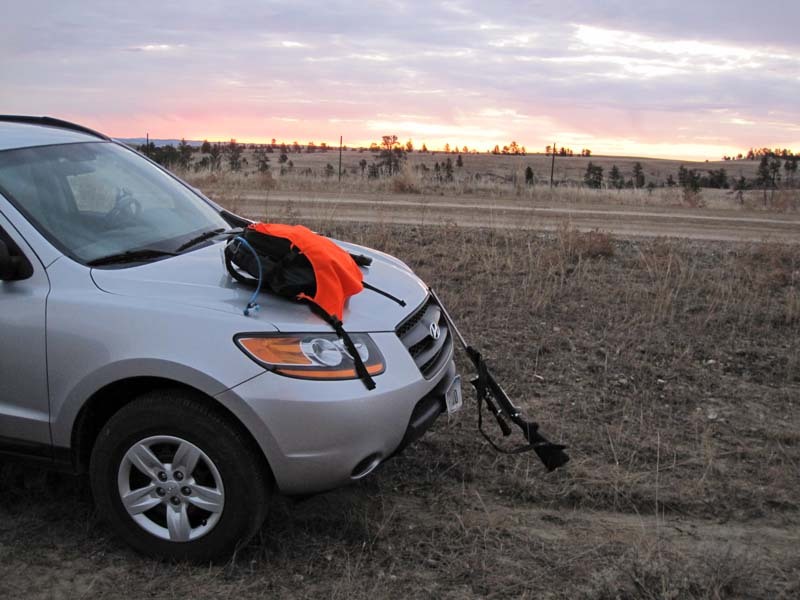 Ok, it's 6 hours later at about 1pm, and I'm back at my rental SUV where I started after a VERY pretty hunt where I saw several deer but didn't get one. 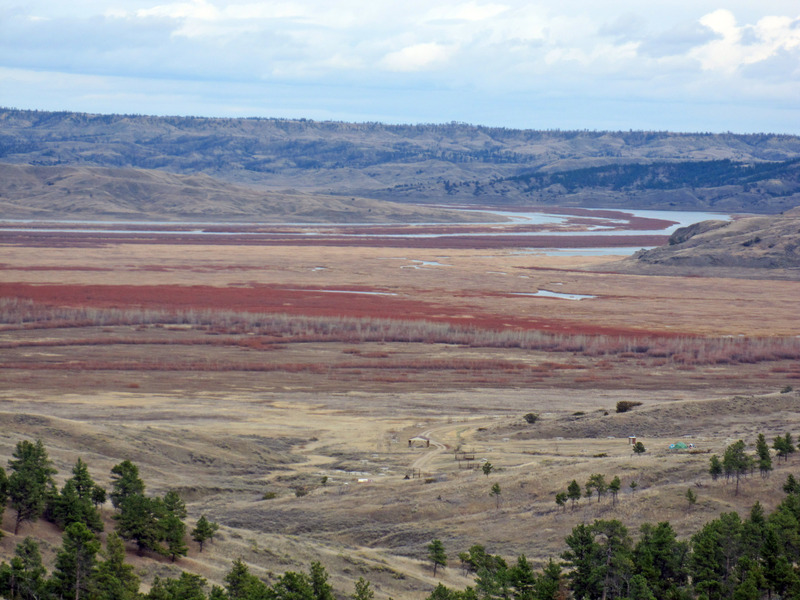 A random picture from the top of a ridge (just off the road) overlooking where Crooked Creek (from the left) joins the Musselshell river (parallel with the horizon). 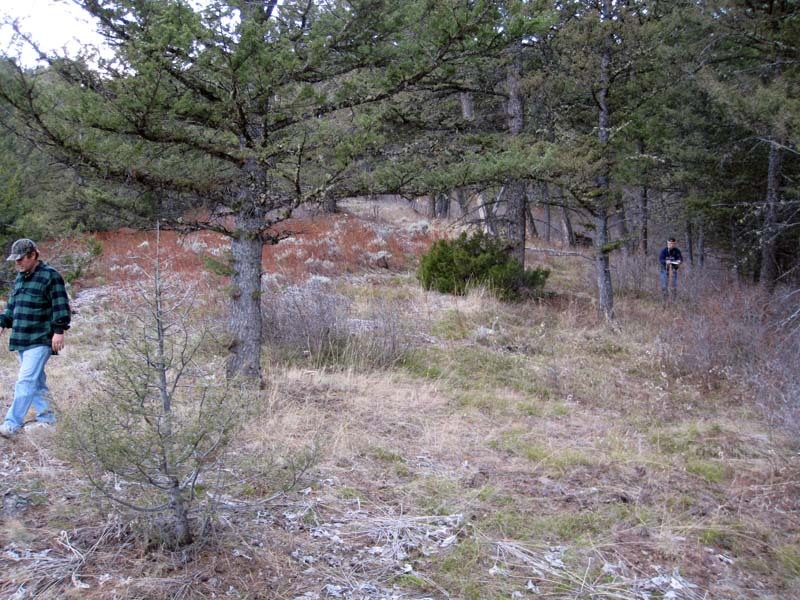 This shows the general terrain we are hunting. Almost same as picture above, also showing our campground down below (see the structures, and you can *JUST* see the tip of our tent peeking out from behind a hill). 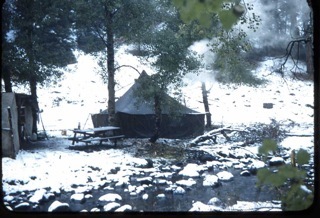 This is the Crooked Creek Campground. 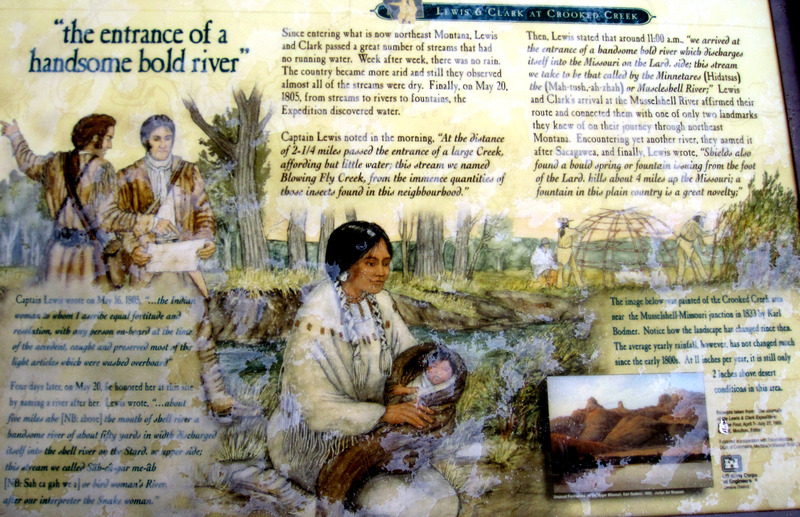 There is a plaque by the road about how Lewis and Clark came through here with Sacagawea. 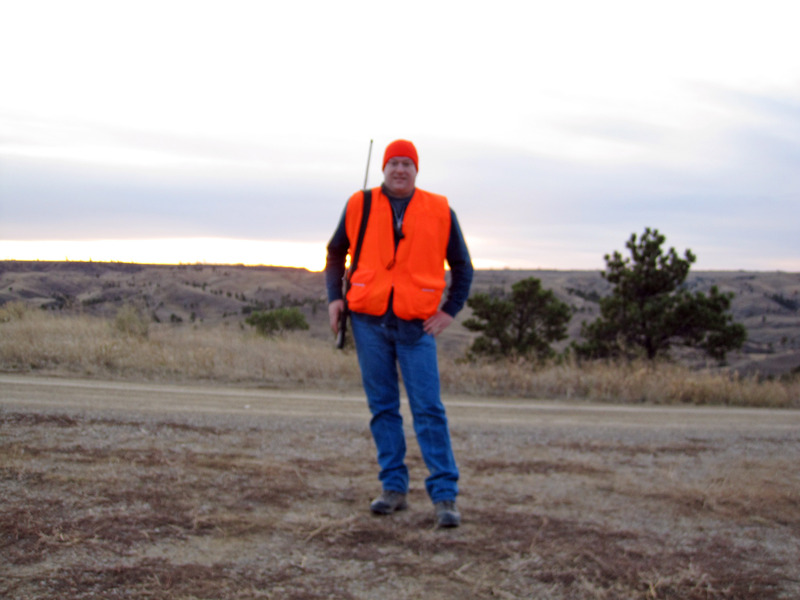 When I dropped back by camp, I found that Steve Sanders had got a buck (male deer) at 8am on the first day of hunting, so we walked out to retrieve it. 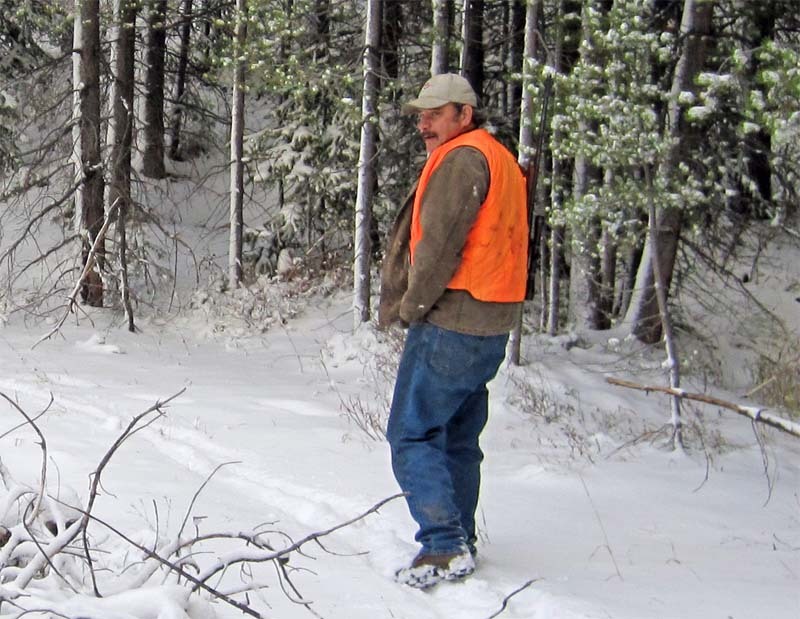 Here we are near where he shot it, that's Steve with his very nice mule deer. 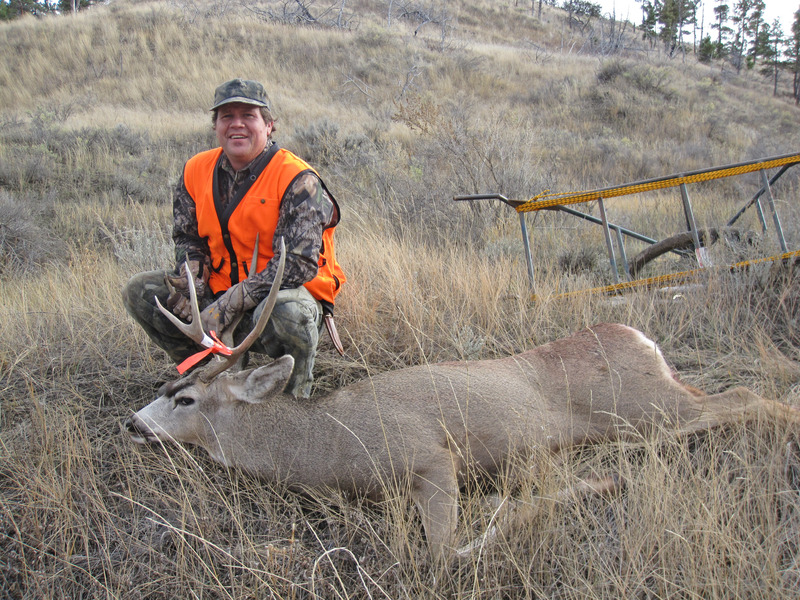 This is the first mule deer Steve has ever got, although he's taken many MANY white tail deer in his life. 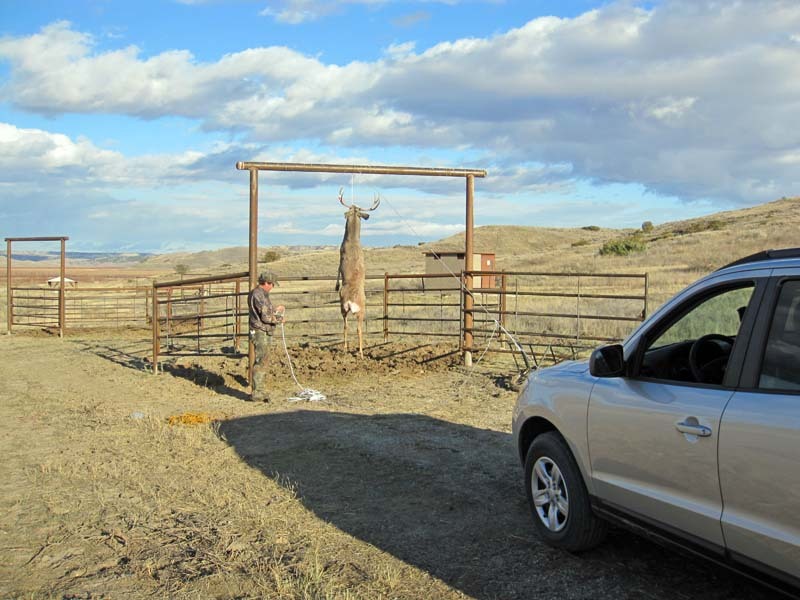 Later back in camp, we decide to hang Steve's deer from the corral. 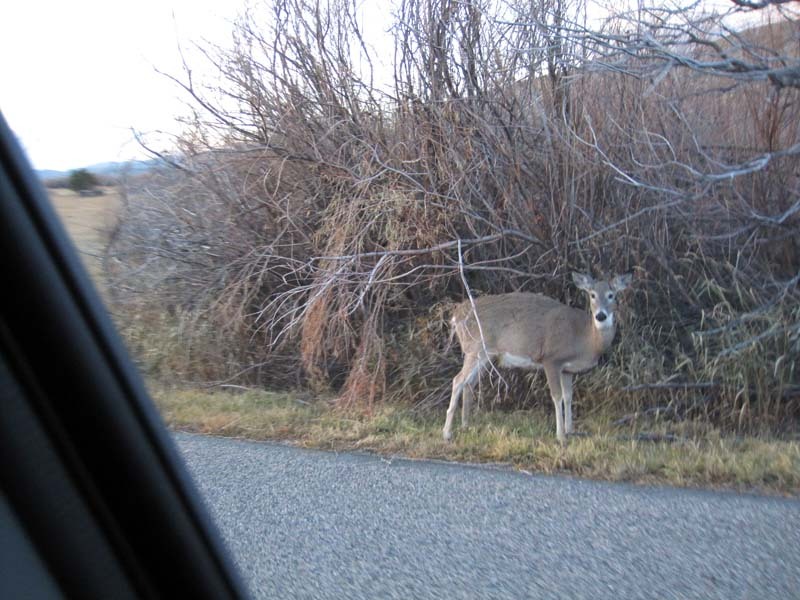 Notice we used the rental SUV to raise the deer up (tied the line to the bumper and backed up). 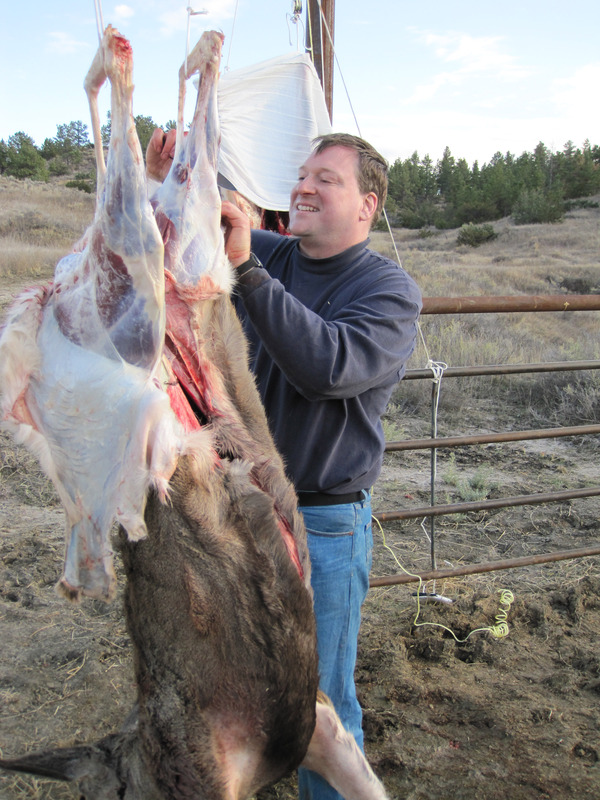 Here is Steve skinning his deer. He is going to have the head mounted (his first and largest mule deer) so he carefully preserves a very long amount of hide around the head for the taxidermist. 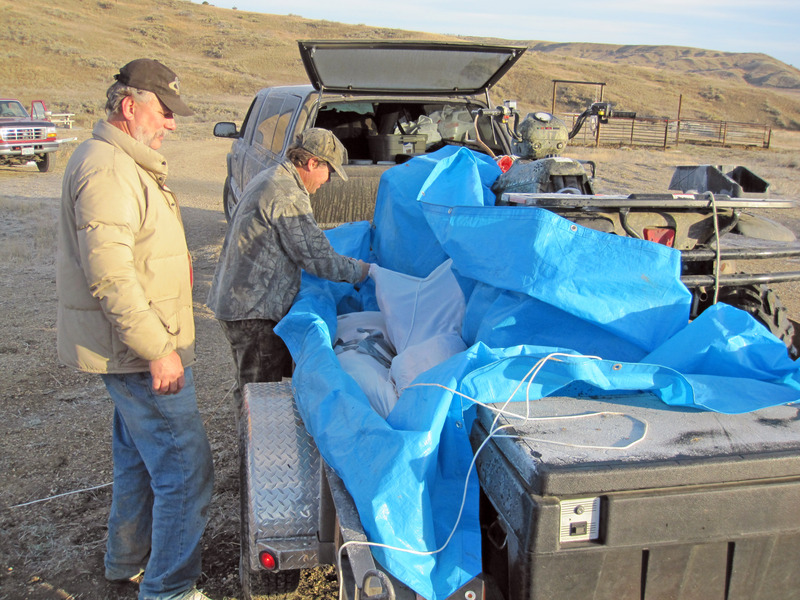 We bag the deer to keep dirt and bugs off of it, below Steve is bagging his deer. 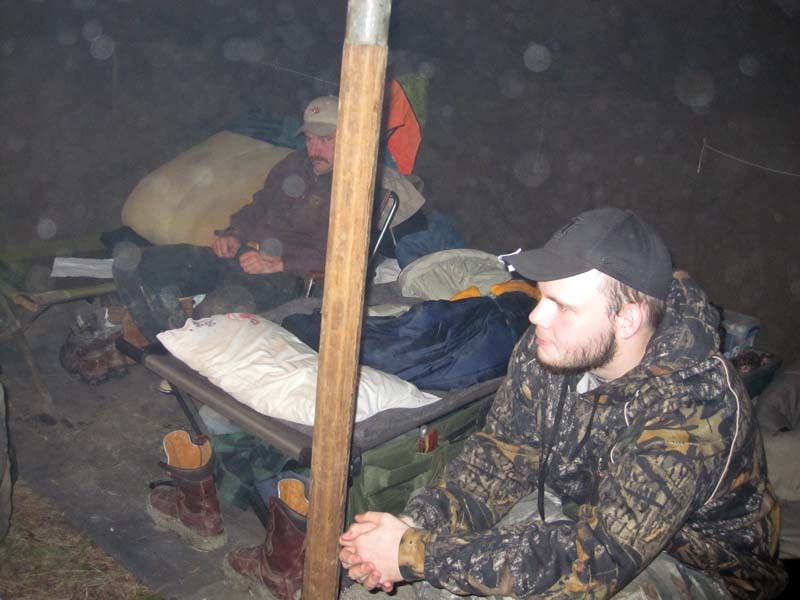 The next morning we get up (again at 4:30am) to start the second day of hunting. That's Chip on the left with the pancake turner, and Steve cooking the eggs. 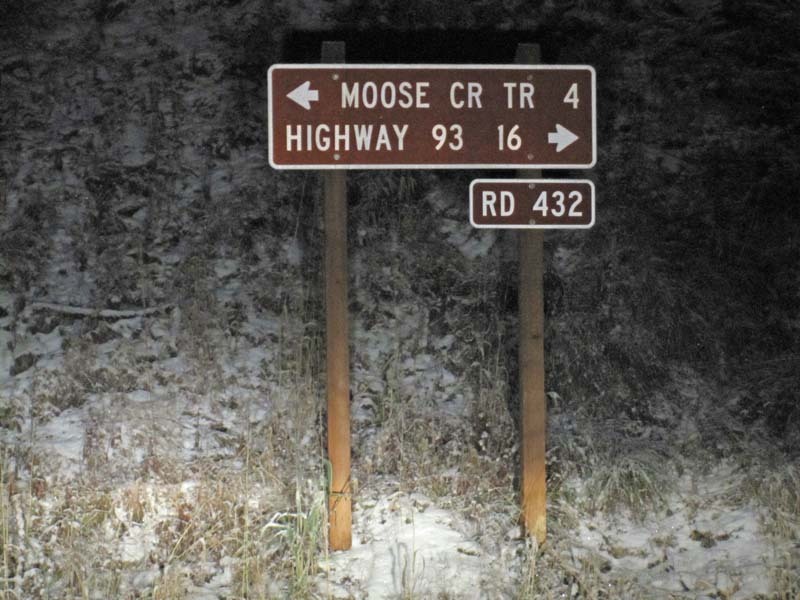 Heading down the road before the sun comes up, I see a deer by the road. I took this picture from the open window of the rental SUV. 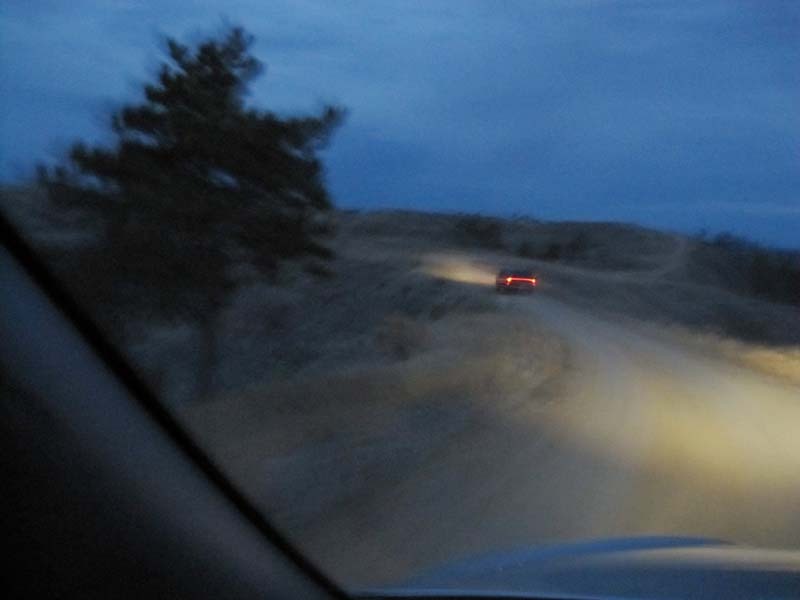 It has been "lightened" so you can see the deer. Click on the picture for a higher resolution original without the red arrow. Another deer a few feet away. It's too early to shoot -> hard to tell exactly what you are shooting at, sun is not up yet (these pictures are aggressively lightened up so you can see the deer) so we just smile and let these deer go on their way. 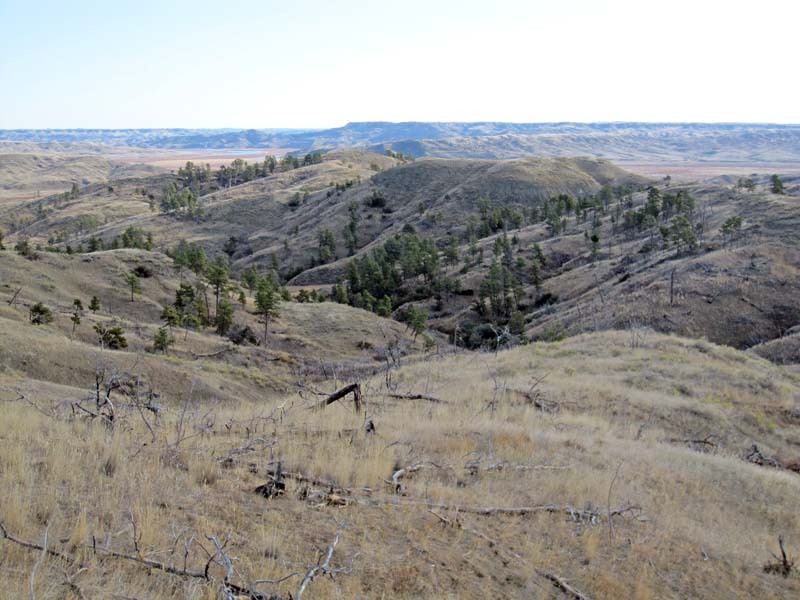 Middle of the day, a panorama of the area we are hunting near Fort Peck Lake, Montana. 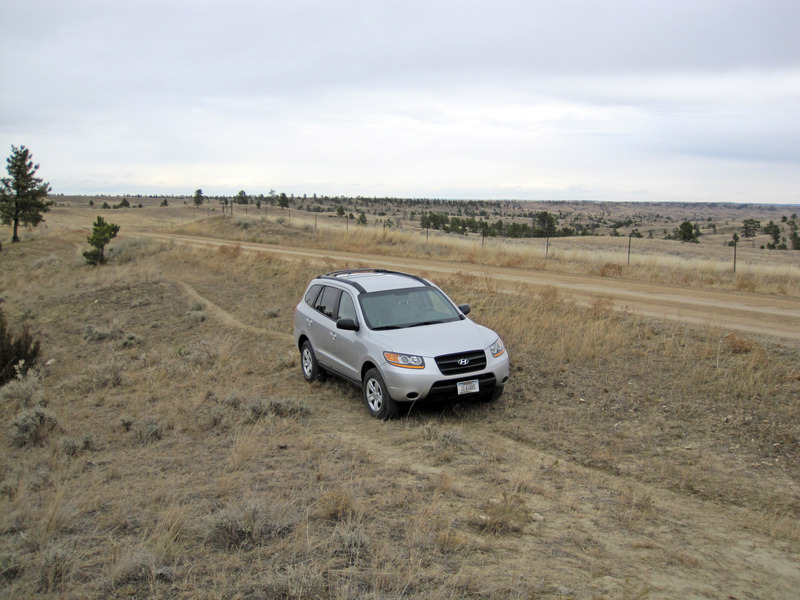 That's my truck (rental SUV) sitting on the ridge. I just walked in a big circle and I'm walking back to it. 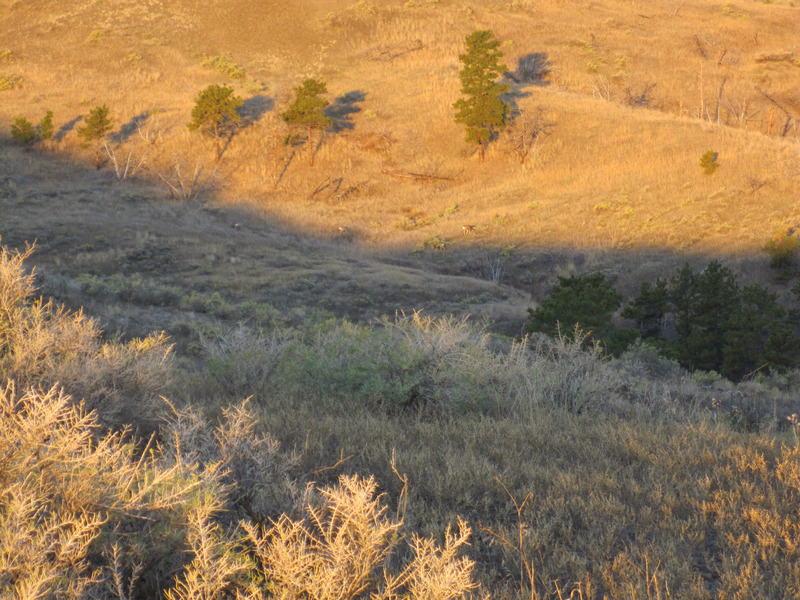 I took a break here, and three deer ran out on one of those hills down below me. I spent an hour walking down there but couldn't find them. Sunset on the second day of hunting. A self portrait (taken with camera timer) as the sun goes down. 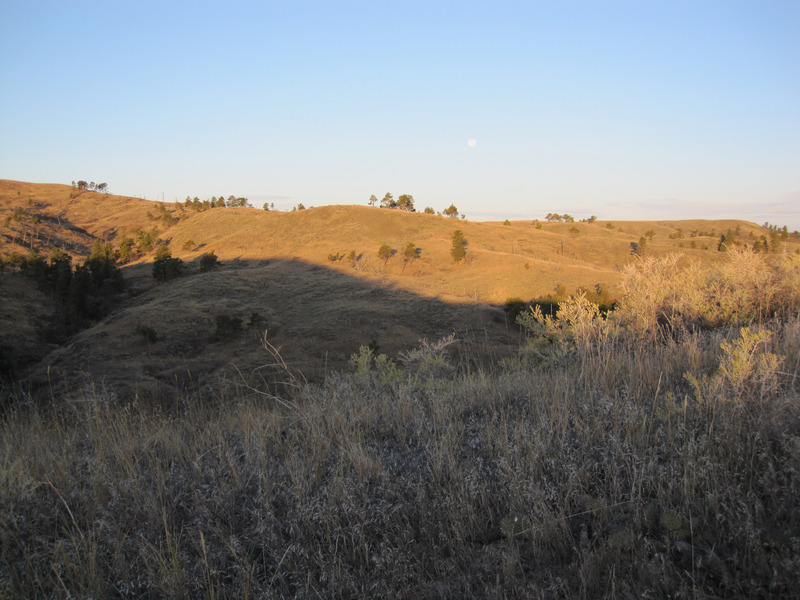 On the third morning of hunting, I walked (not drove) out of camp up to the areas of rolling hills right next to Crooked Creek Campground. 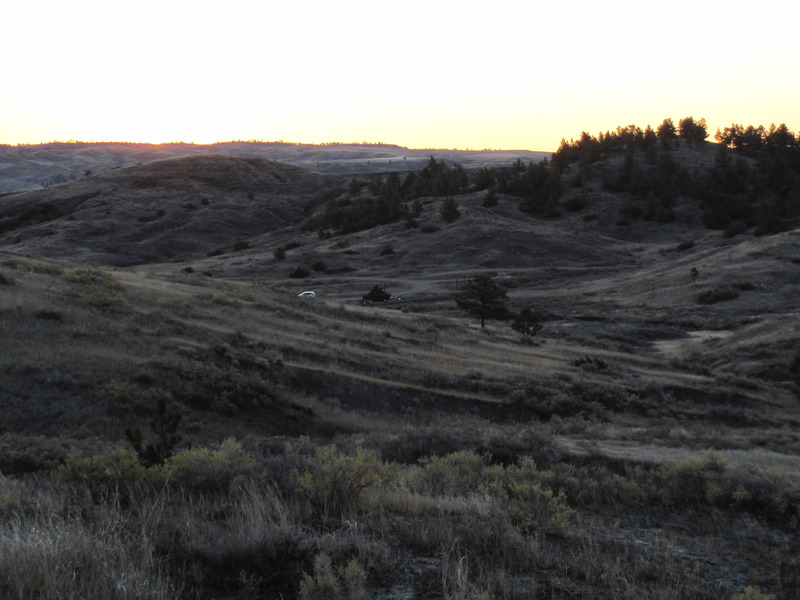 Here I am looking back down on our camp in Crooked Creek Campground at about 7am as the sun comes up. 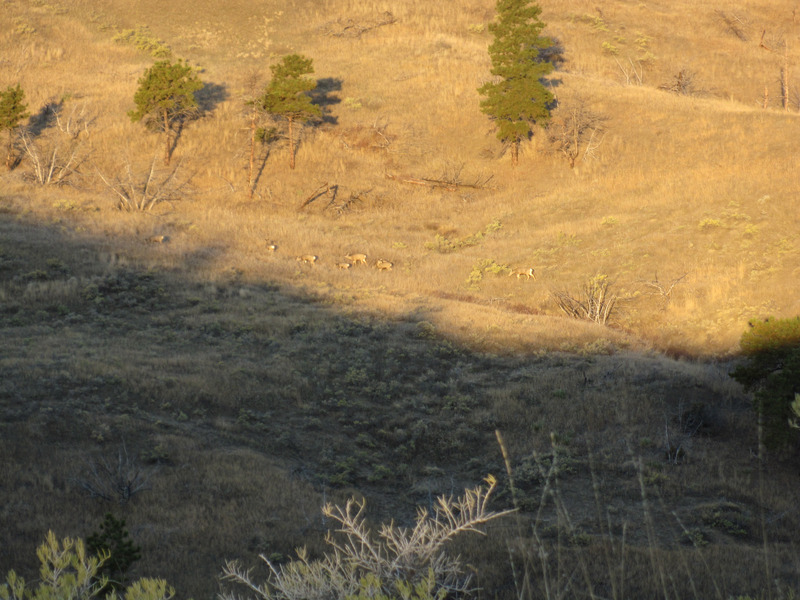 As I came over a ridge at about 8am, I spotted some deer in the distance. CLICK ON THE PICTURE BELOW to see a much larger, clearer version. 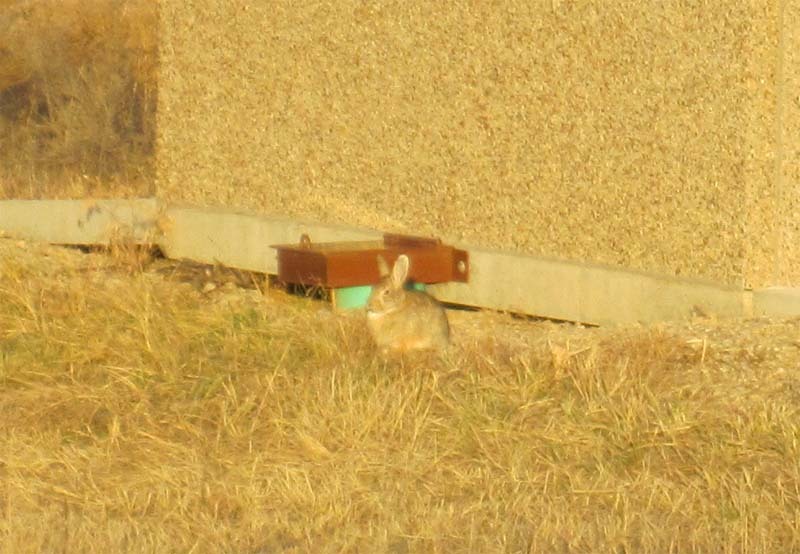 Here is the same picture as above, just at maximum zoom of my camera. 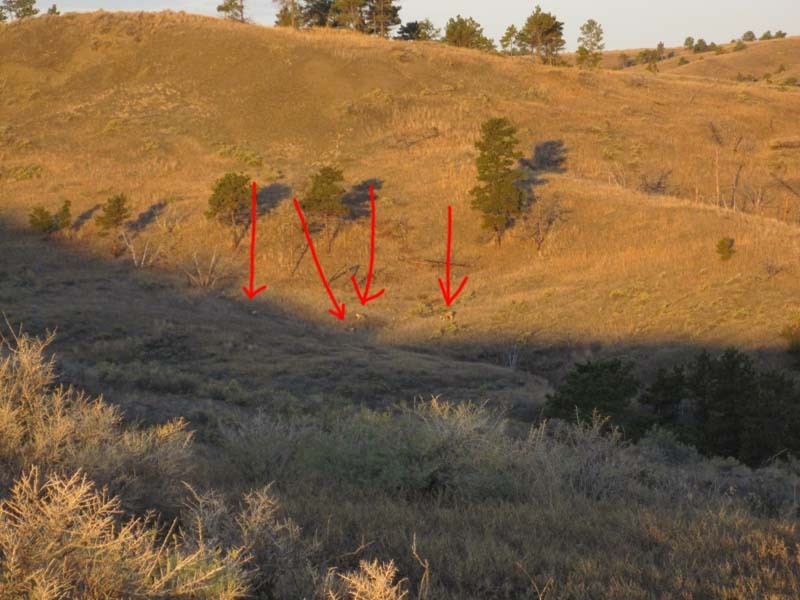 There are at least four deer in the picture below. Again, zoomed back out as I see it. Another picture as I get setup. 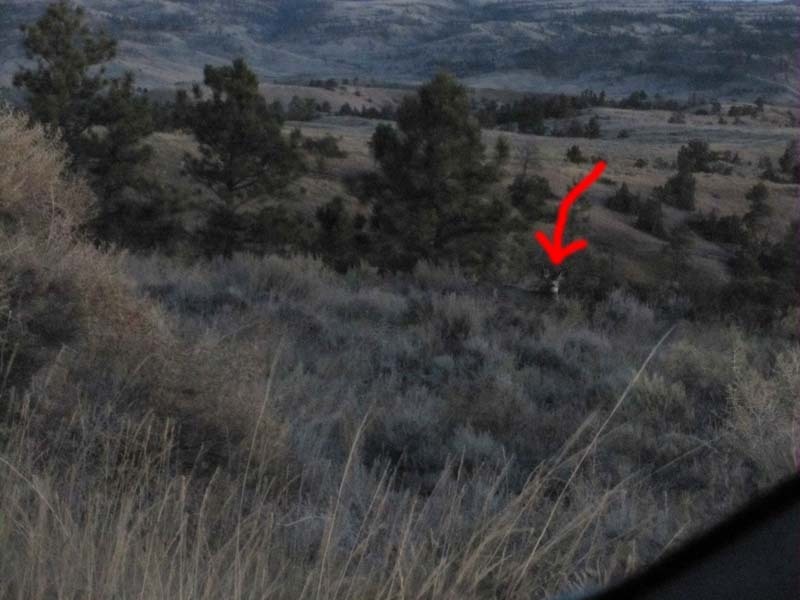 Another hour later, and I see this deer walking up the hill a long way away from me. The picture below is zoomed all the way in as far as my camera can reach. I think there is another deer in this picture (a total of two) but I can't quite find him in the picture below, probably obscured for the moment I took this picture. I did not attempt this shot after my earlier miss, this was an even greater distance. 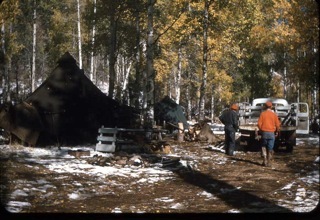 A picture back towards camp. 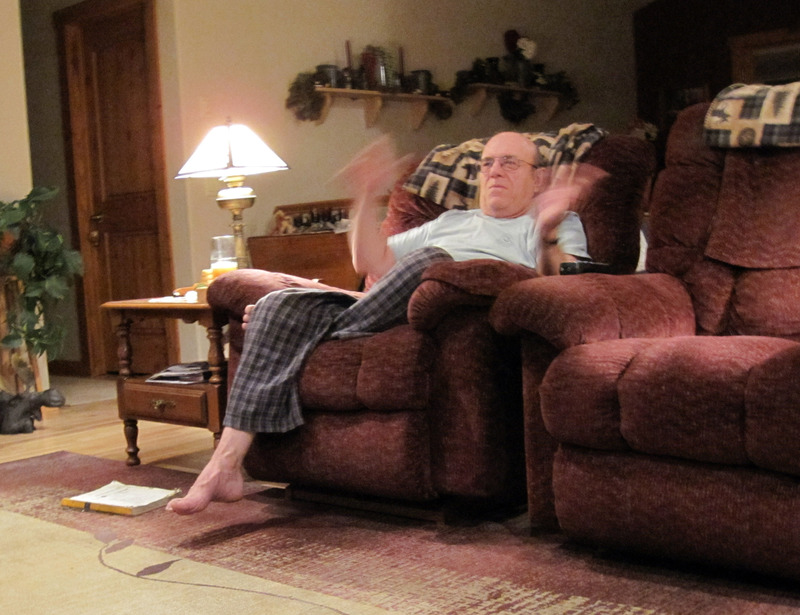 A self portrait taken with the camera timer. That's me (Brian) in the picture. 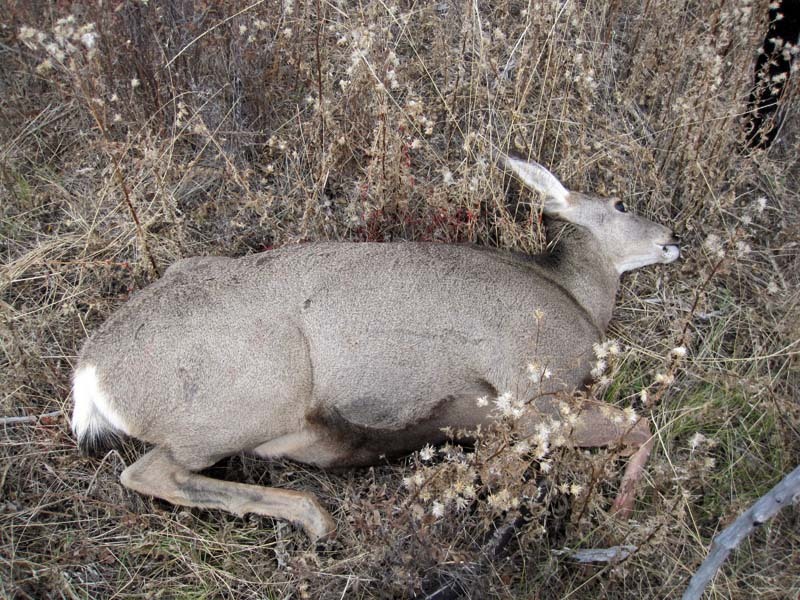 At about noon I shot this doe (female deer) about a half mile from camp. 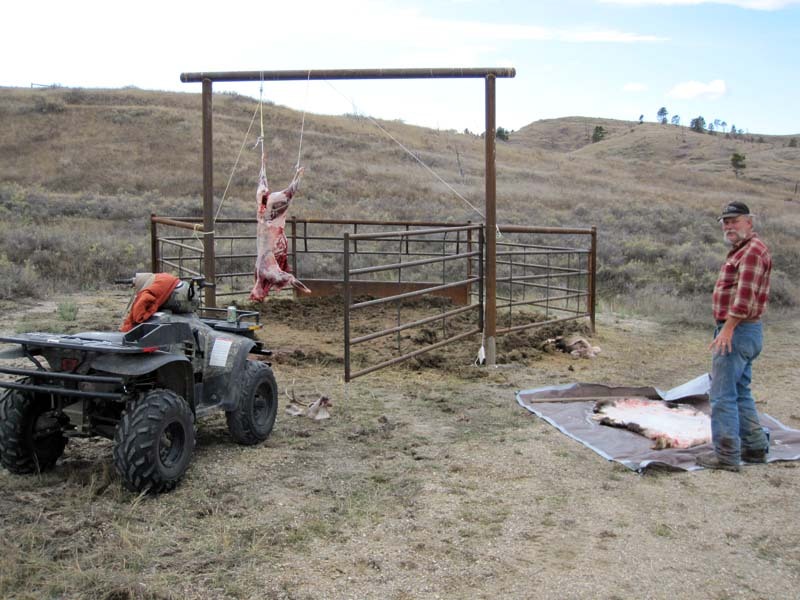 Now the work starts to field dress her (take her organs out so the carcass can cool) as soon as possible, and then go back to camp to get help to carry her out. 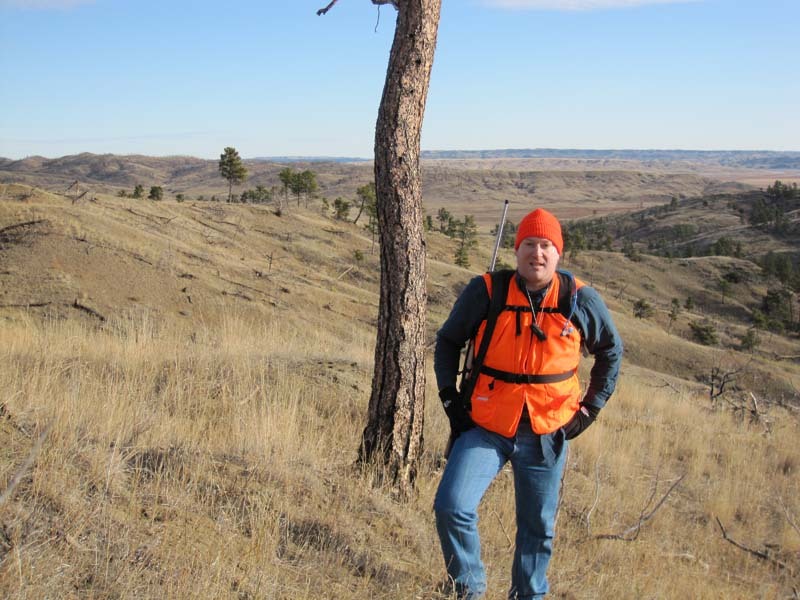 Below the deer is field dressed (the gut pile is off to the left) and I'm ready to hike back to camp to get the "deer cart" and some help to carry the deer out. I mark the location with orange tape. 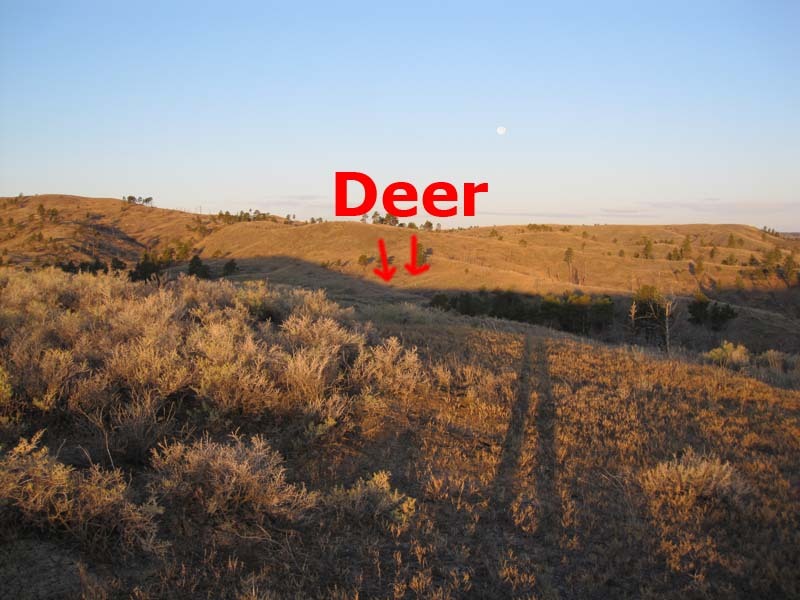 It's easy to forget the exact location of your deer if you don't remember to mark it. Back in camp, Chip was ahead of me! He got a buck (male deer) at 10am and has already finished skinning and cleaning it. Just in time to help me got fetch mine. 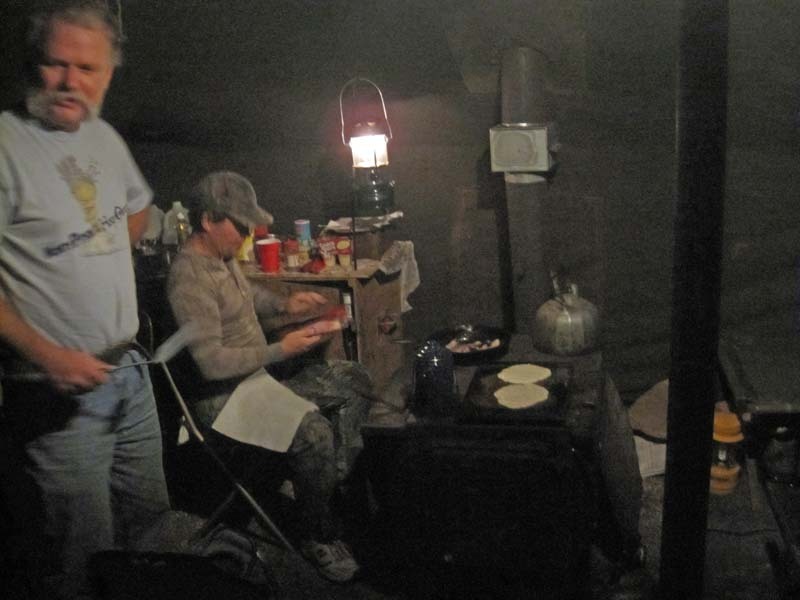 Chip and I went out with the deer cart and fetched my deer back to camp. Below that's me after an hour and a half at about 2pm with the deer still on the "deer cart". 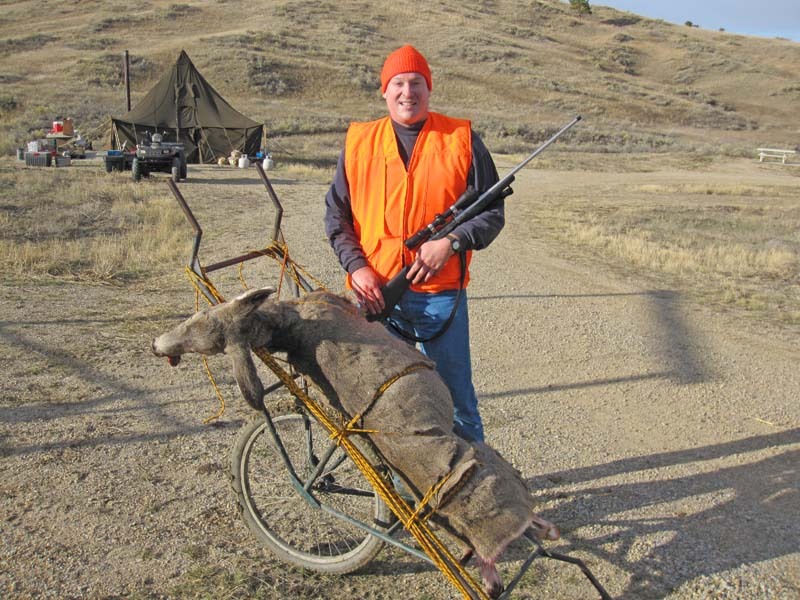 I'm holding my 7mm Remington Magnum hunting rifle I shot this deer with. 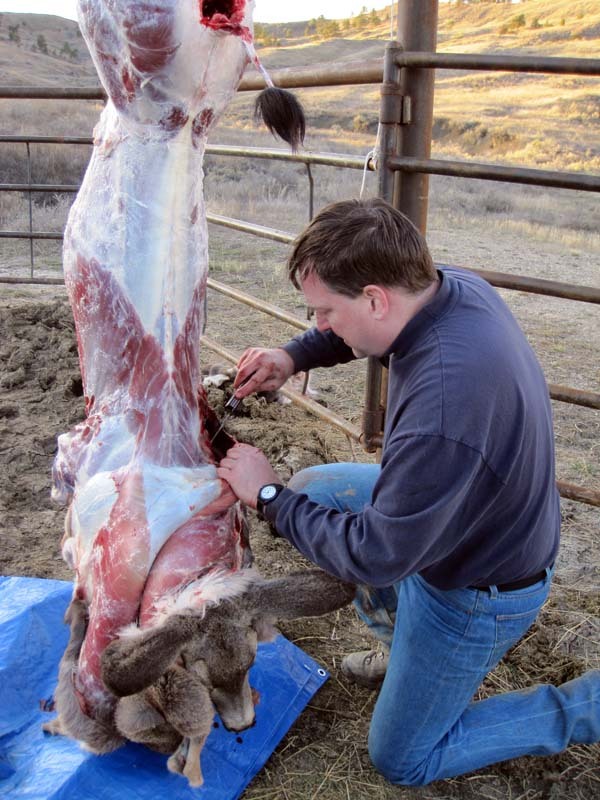 It is important to get the deer skinned as soon as possible, hopefully before nightfall so it can freeze within a few hours of being killed. Below I am starting to skin my deer. 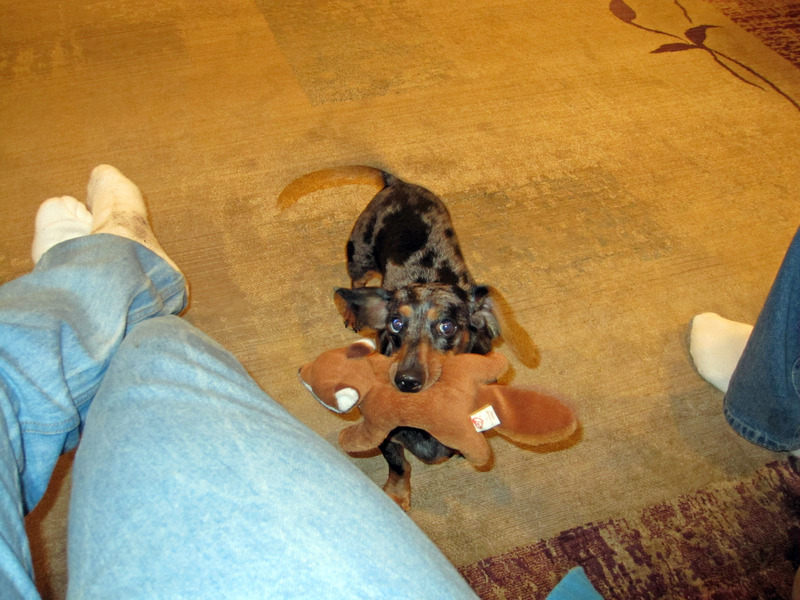 We hang it from the hind legs to make this all easier. 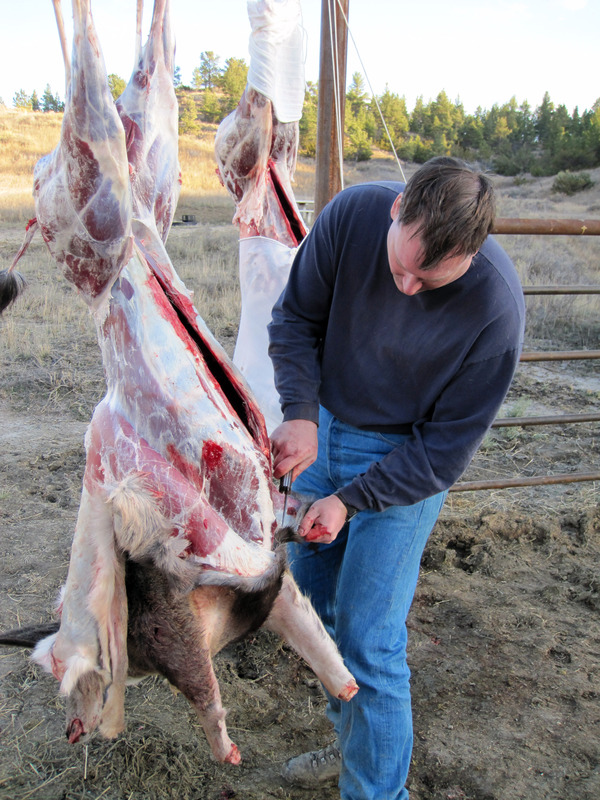 Below I continue to work on skinning my deer. A little while later, making progress. What I'm working on in the picture below is wound where the bullet entered the deer's body (behind the front left shoulder). The bullet damages the meat, bruising it and tearing it up, and it's important to cut out the bad parts to save the rest of the good meat. Finally done! 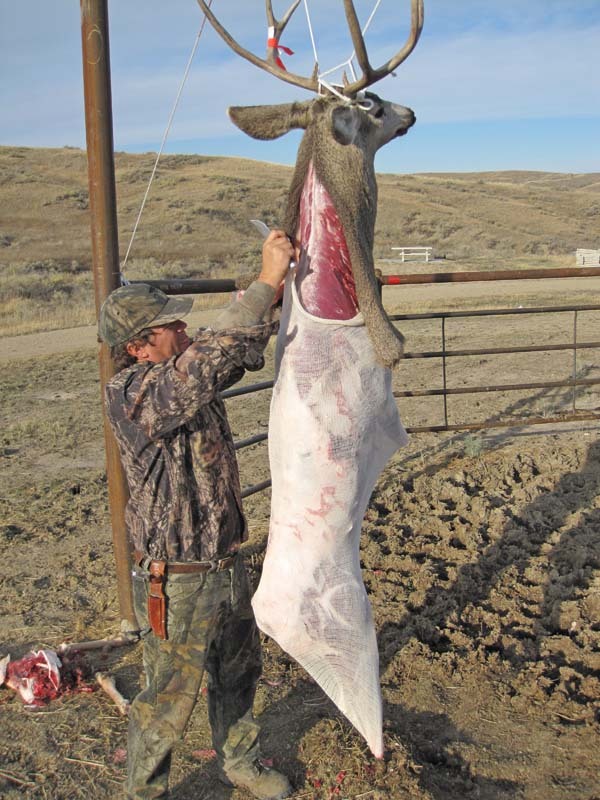 The deer in the picture below is "bagged" in a "game bag" which keeps flies and dirt off of it while still hanging. In a few hours it will freeze as night comes, keeping the meat fresh. 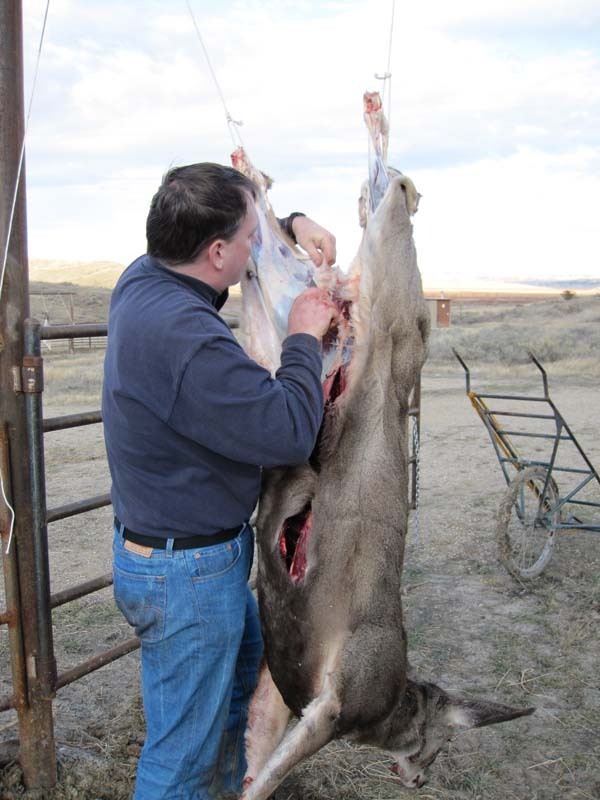 The final step is to rub salt into the flesh side of the hide to start preserving it and keep it from rotting. I also roll it into a ball and put in a clean garbage bag to be taken to the tanner. Breakfast the final morning. Steve cooking eggs and pancakes, and Bruce on the right waking up. I won't be hunting this day because my deer tag is now filled. A picture of Crooked Creek Camp. It's deserted except for us now. 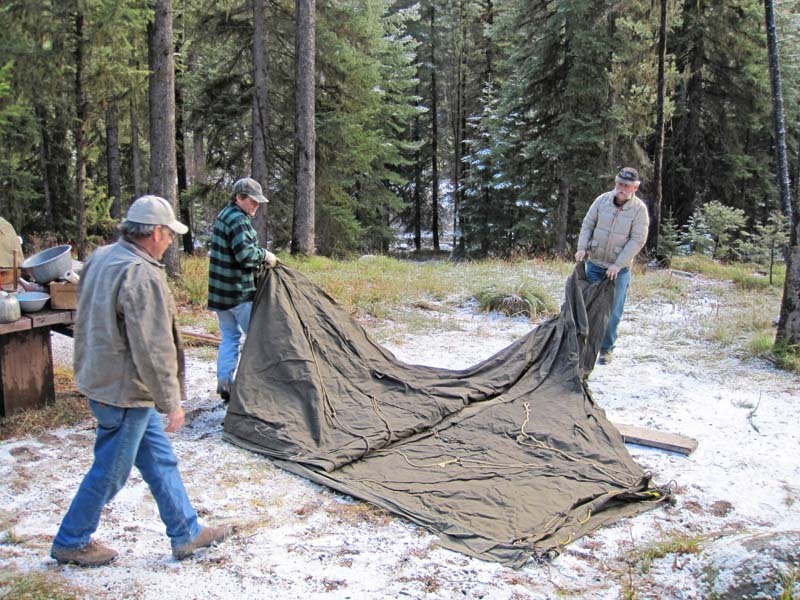 Starting to pack up camp for our departure tomorrow. 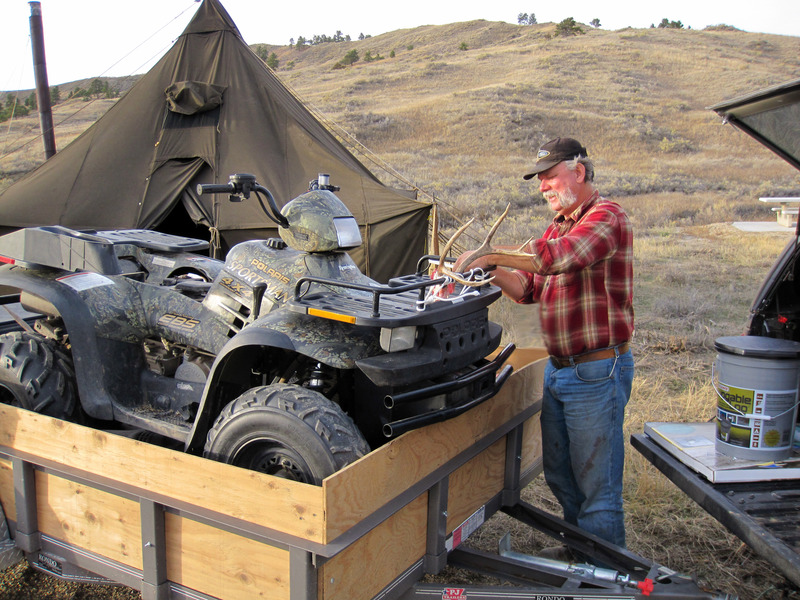 Chip ties his antlers to the ATV. Steve goes for a walk with a camera, you can see his hunter orange in the picture below if you look closely. Steve filled his deer tag so he isn't hunting anymore. 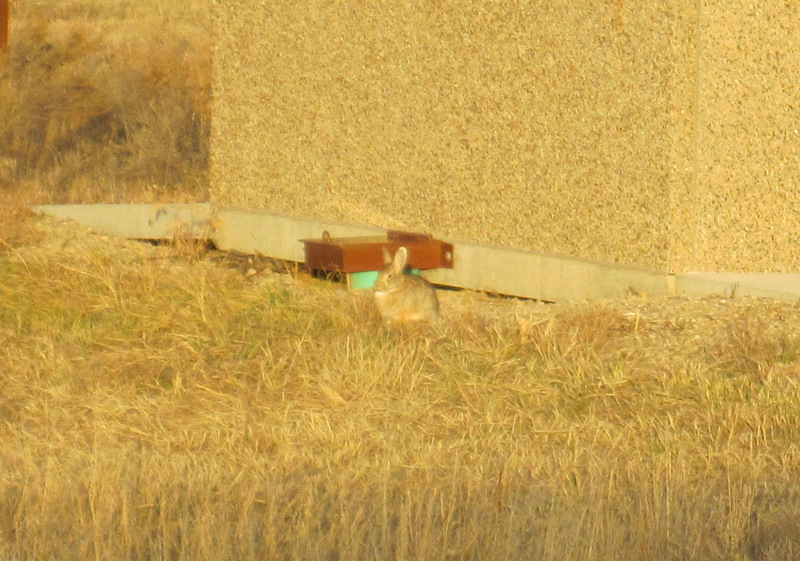 A bunny rabbit near camp. A random picture of the cots setup along one half of the tent inside. 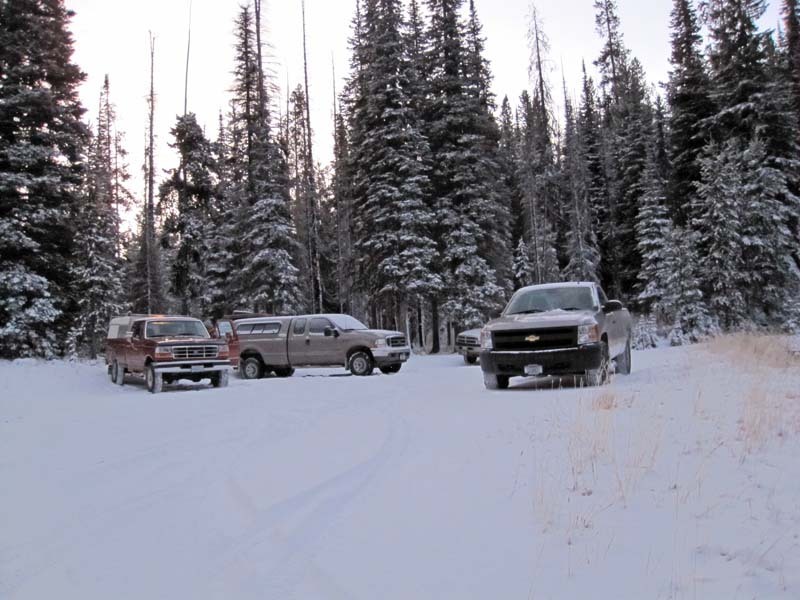 As we pack up to leave on Thursday, November 5th, 2009 in the morning, we load our three deer into the trailer. That's Chip on the far left, and Steve Sanders in camo. Heading out of Crooked Creek Camp all packed up, going the 50 miles to Winnett. 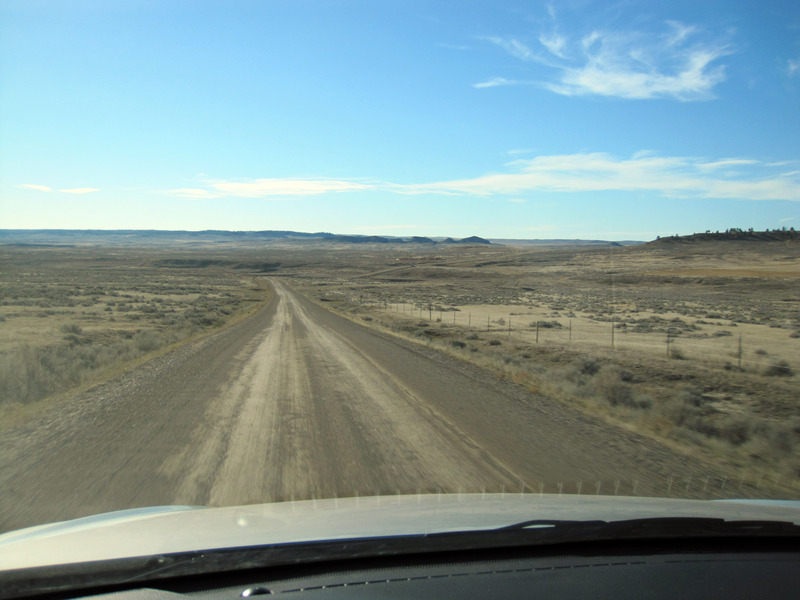 Here is the dirt and gravel 50 mile road to Winnett, Montana. 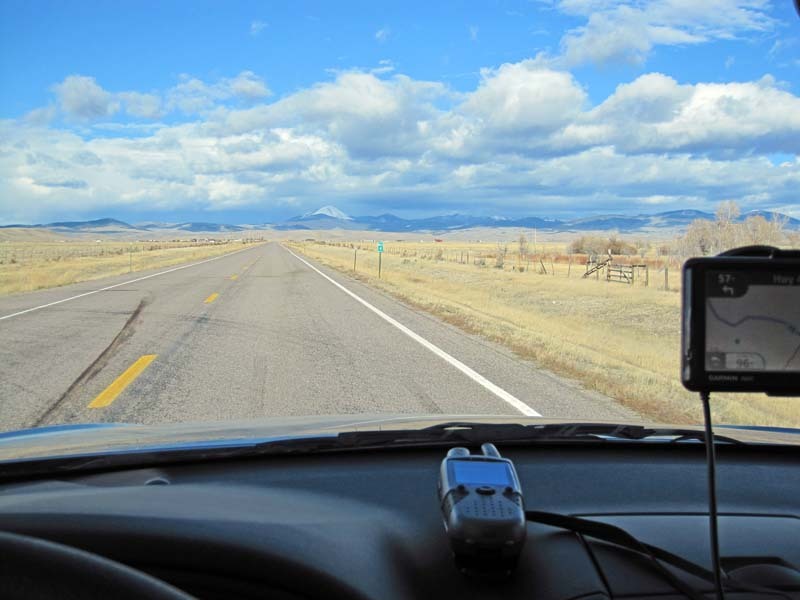 Down the way, we head for Livingston, Montana. We come across a windmill wind farm generating power out here. 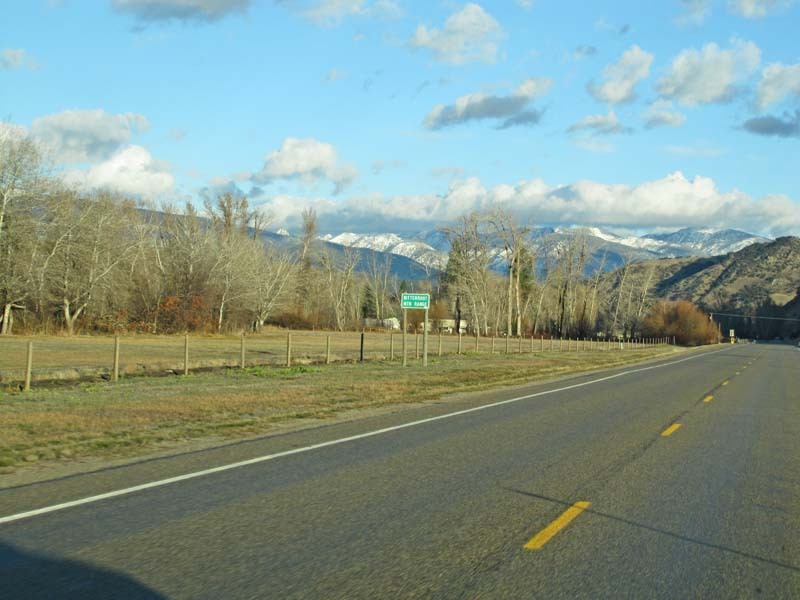 Pretty mountains, I think this is Highway 191 heading south towards Livingston, Montana from the north east (just to the east of Bozeman, Montana). 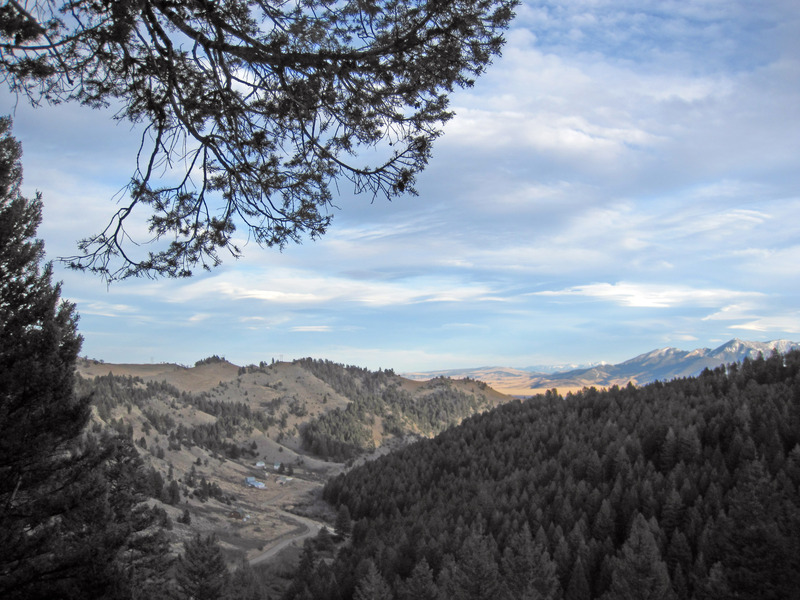 More pictures of the scenic Montana mountains. 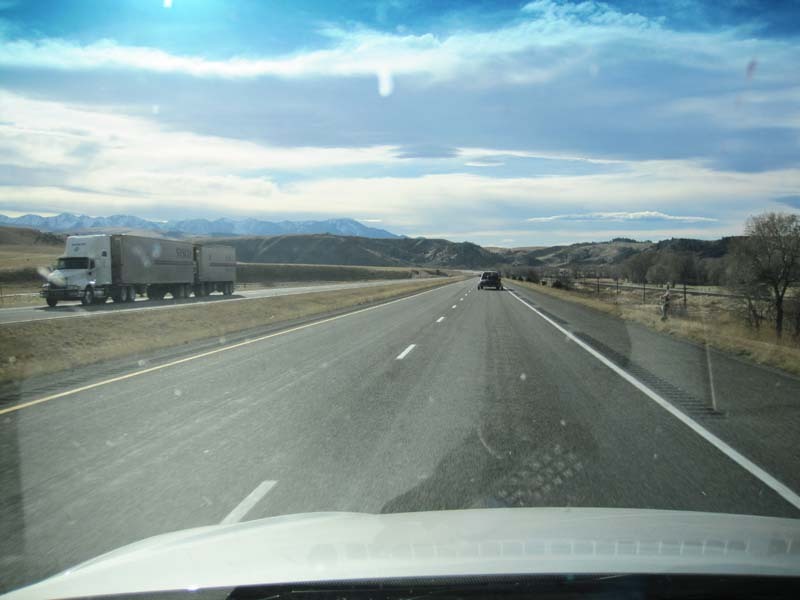 Here we are on US Interstate 90 heading into Livingston, Montana. 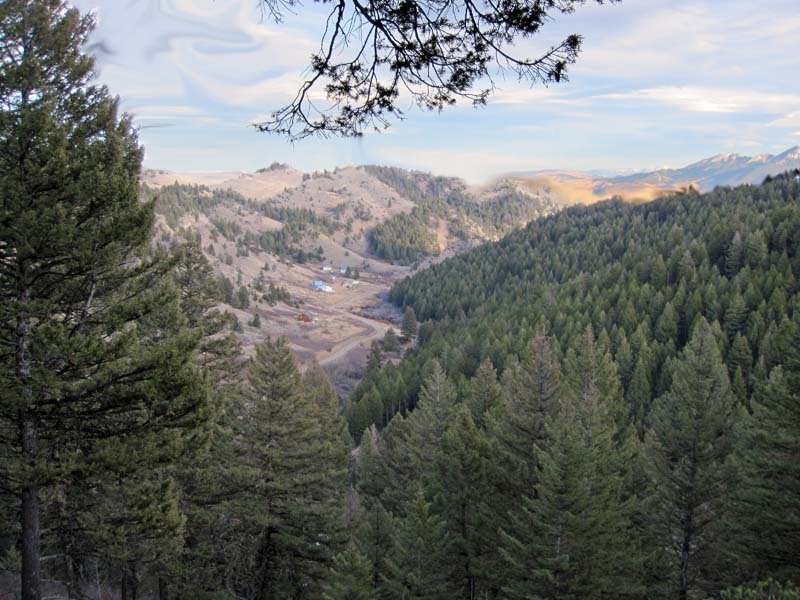 Chip just bought about 20 acres of land outside of Livingston, Montana. We're dropping by to take a look. 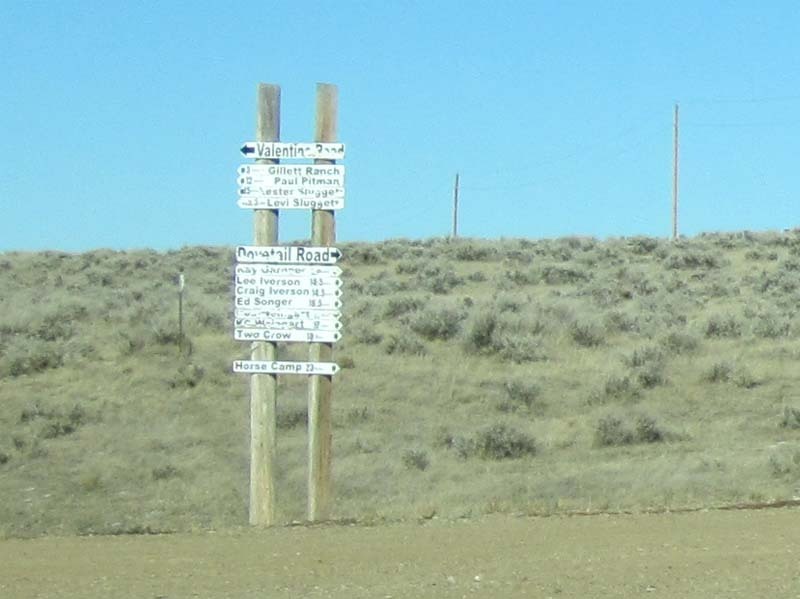 Below you can see a picture of Chip's land from the road. His land is basically the entire hill on the right of the picture below. CLICK HERE for maps, GPS, and more descriptions of Chip and Robin's Land. We hiked to the top of the hill, and here is a picture pointed in the opposite direction looking down the hill towards the road we just came up from. We are standing on Chip's (and wife Robin's) land here. Another picture taken at about the same place. Chip in blue walking over his land looking around. 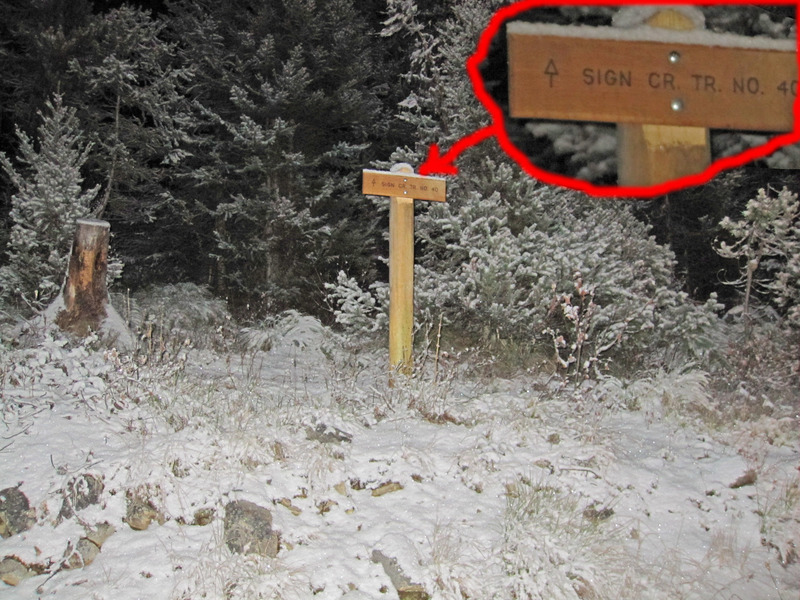 This is at the top of the hill on Chip and Robin's land. We're finding all four corners of the lot. In the picture below we're at the back corner at the top of the hill where you can see Chip standing behind an orange tape on a fence post. Steve is at the far left of the picture. 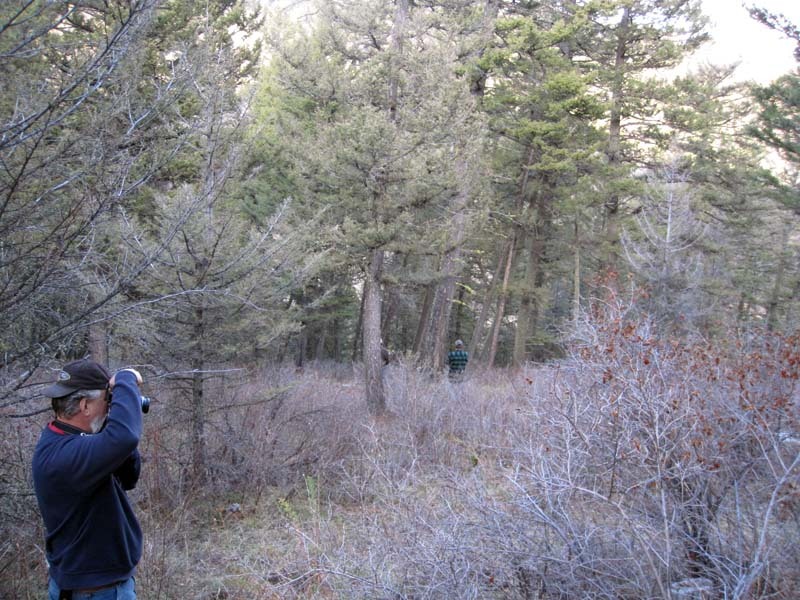 Chip taking some pictures of his newly purchased lot of 20 acres in Montana. A picture along the road next to Chip and Robin's new land. 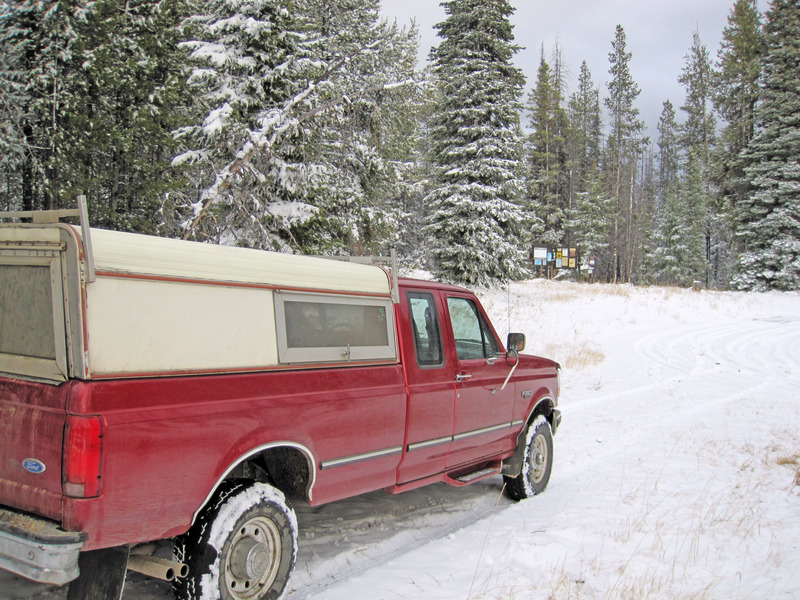 Onward we stop at Joe and Ruth Stickrod's home outside Ennis, Montana. That's Pooky Lou who I think remembers me from 3 years earlier. 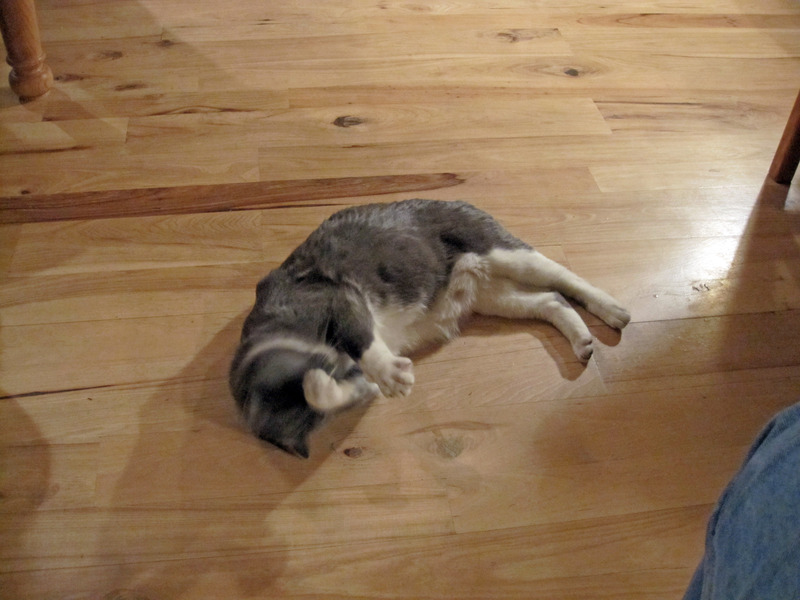 Click here for a video of Pookie Lou playing with a kitty cat here in 2006. 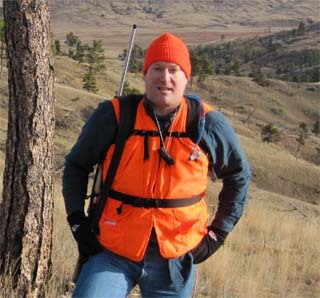 Joe Stickrod in his home outside Ennis, Montana. 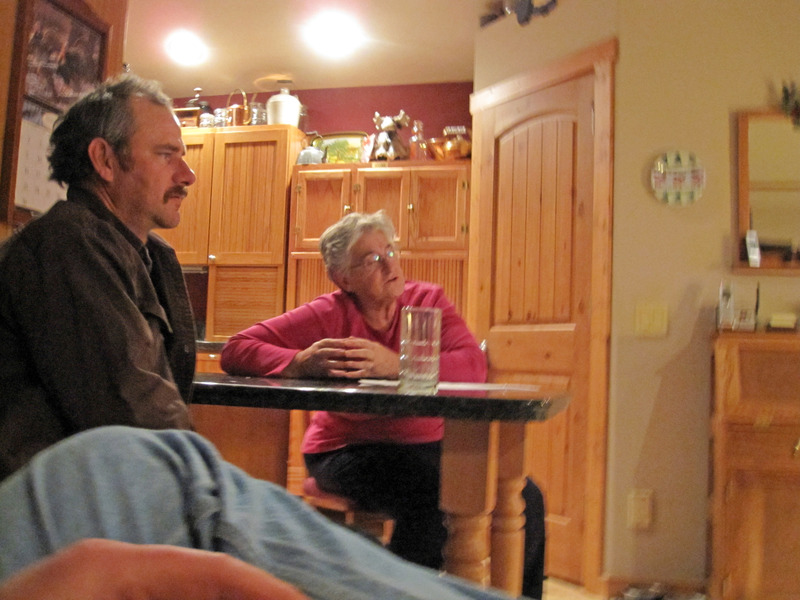 Ruth Stickrod in her home in Ennis, Montana. That's her son in law Bruce at the left of the picture. 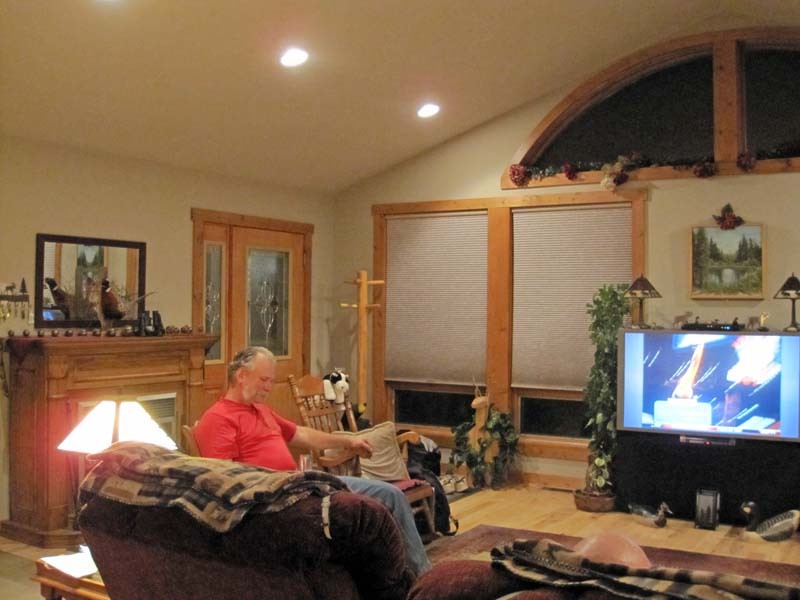 Chip reading quietly in the Stickrod home near Ennis, Montana. 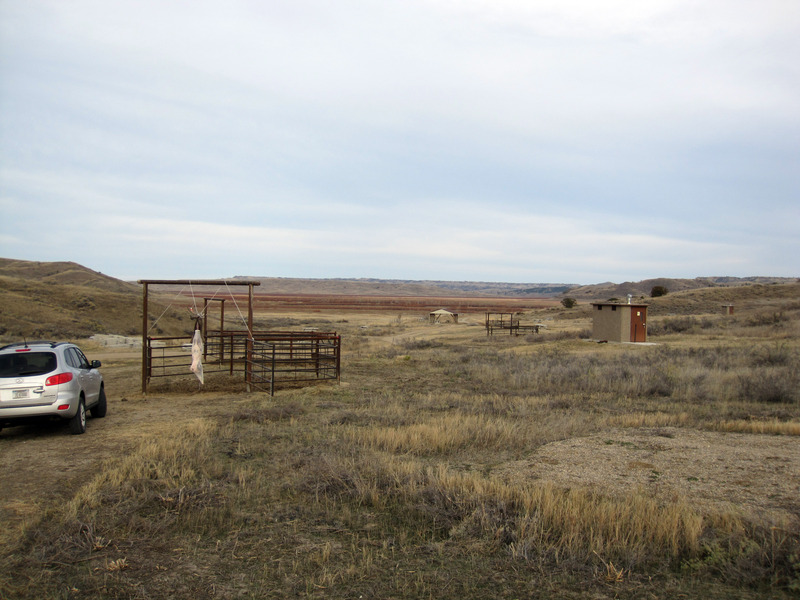 Here is the outside of Joe and Ruth's home near Ennis, Montana. Sunrise outside Joe and Ruth's home, it is very pretty here. 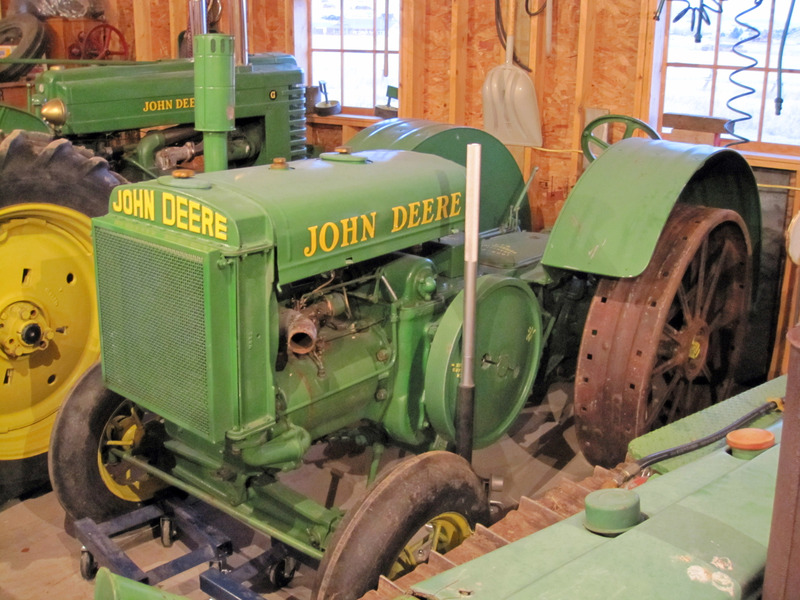 Joe collects John Deere antiques and classics. Below is his John Deere 1928 model 'D' tractor. 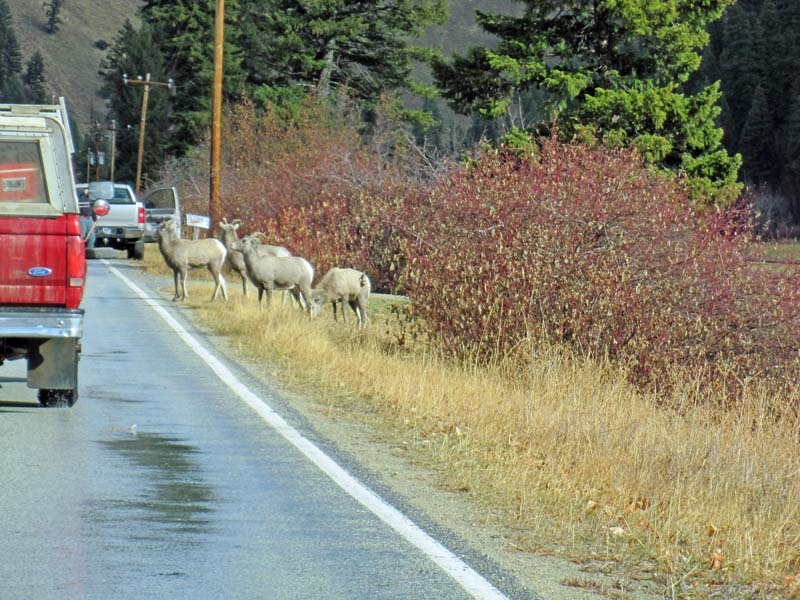 As we head out of Ennis, Montana, there are deer right be the side of the road. There is one now. 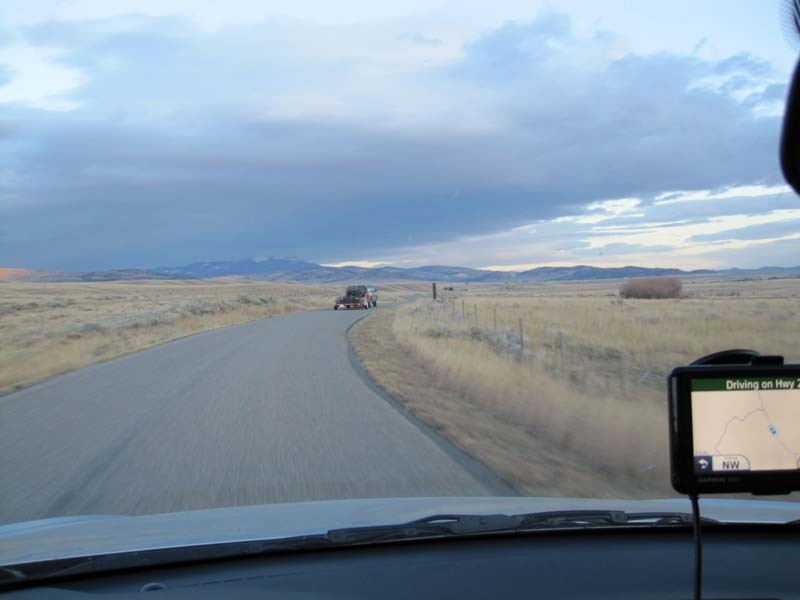 Heading across Montana towards our elk hunting grounds on Montana State Highway 287. 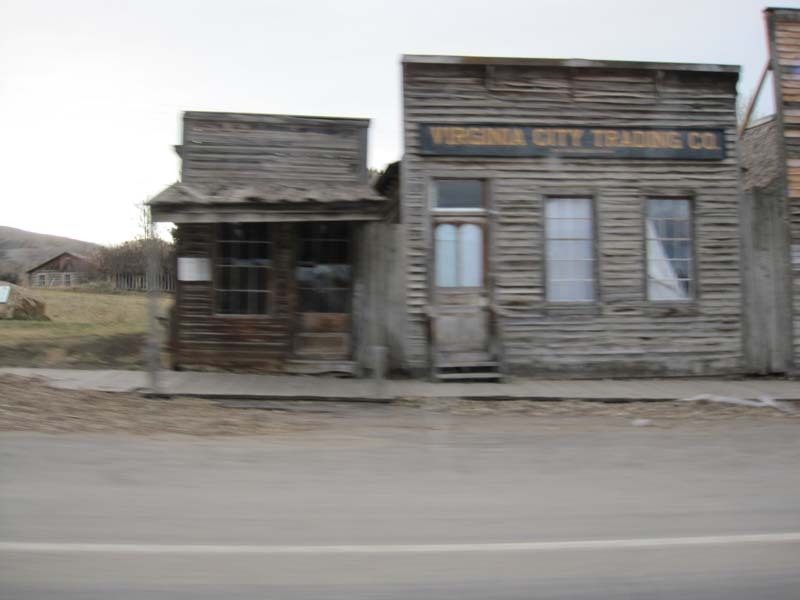 We head through Virginia City, Montana. It is a ghost town that has been converted to an open air museum and now has 130 residents. It keeps the classic look, over half the buildings were built before 1900 so what you see below is authentic. 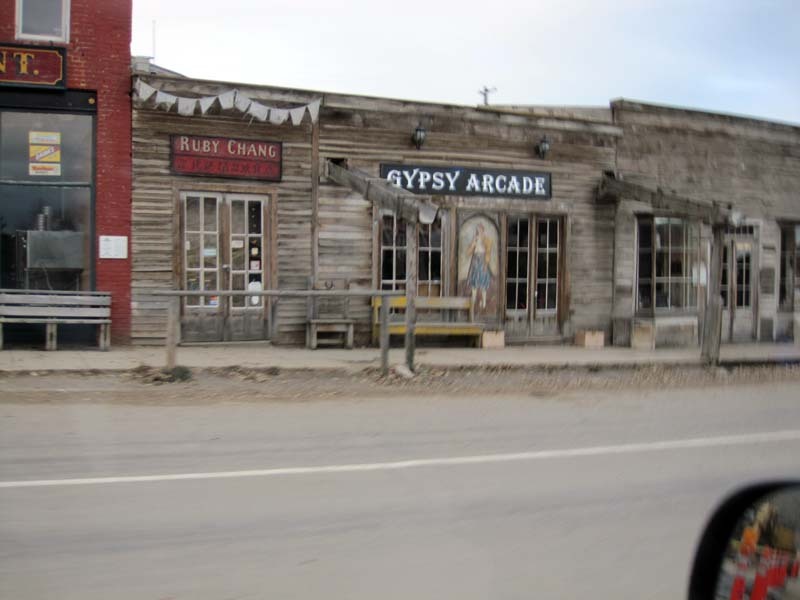 Another random shot as I drive through Virginia City, Montana. Below is "Ruby Chang" and "Gypsy Arcade". 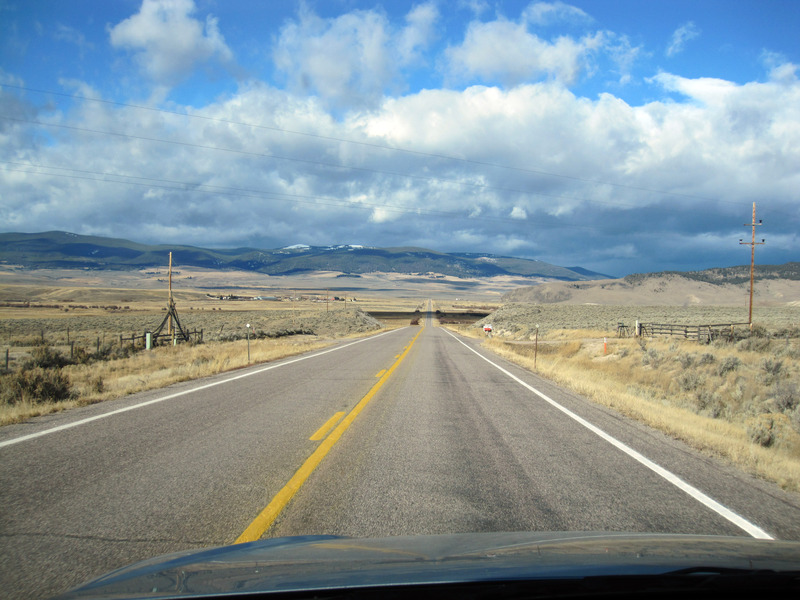 A very pretty drive west out of Wisdom, Montana on Montana State Highway 43. Another shot in about the same area. The snow starts to fall as we approach our elk hunting grounds. 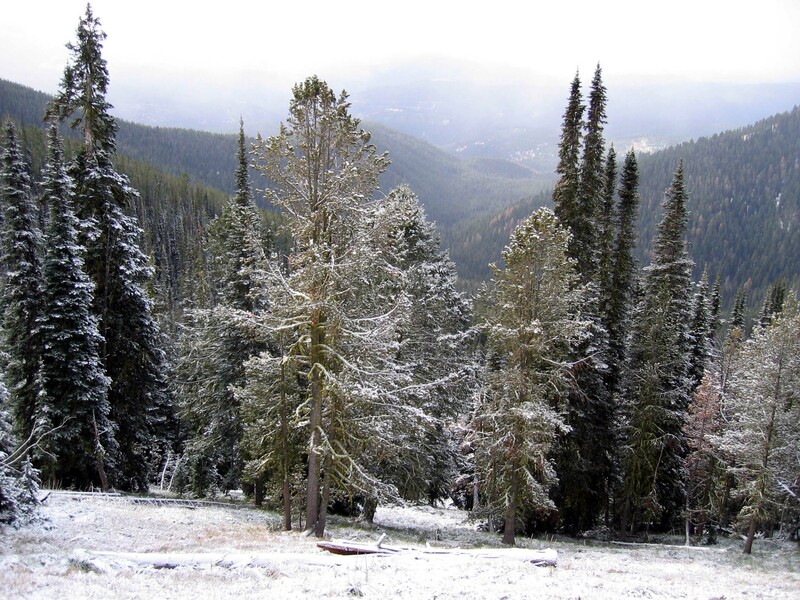 It is early November in Montana, and we're up near the Continental Divide, it's cold here. Sula Montana! You're pretty much looking at the main town -> it is one building. 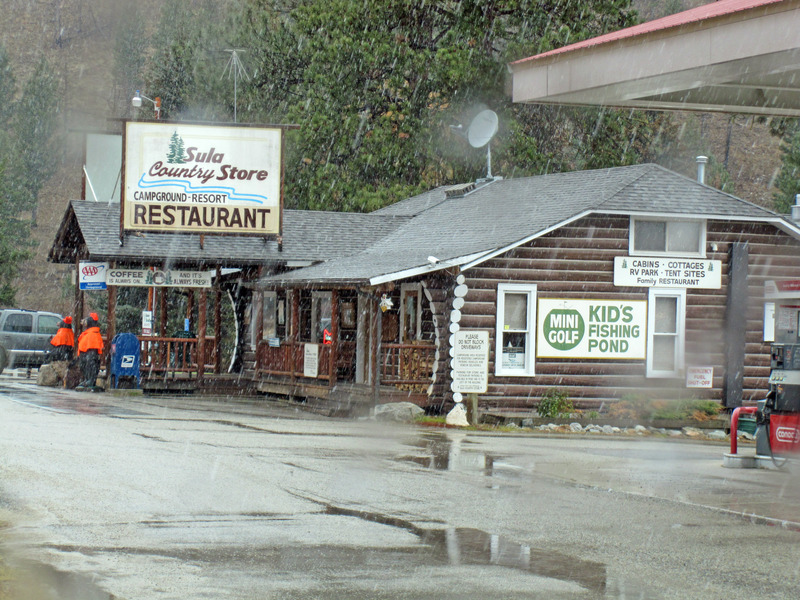 Below is the Sula Country Store, Campground, Resort. We stay about 16 miles up some small roads in the mountains from here, but we come here to buy a shower every couple of days and any supplies we need. There is a small restaurant that will make you a pretty good burger, and the owners are nice helpful people. 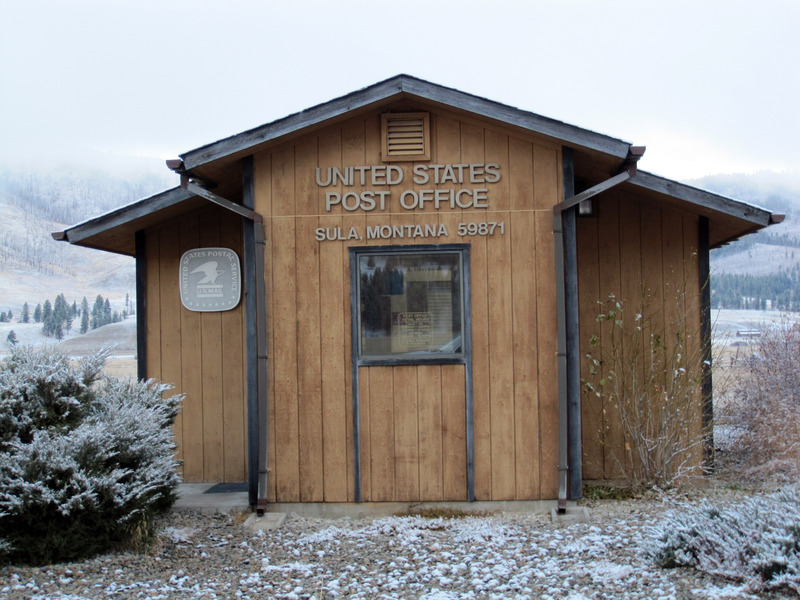 A mile away is the Sula, Montana United States Post Office, all alone, no other buildings for a mile in any direction. 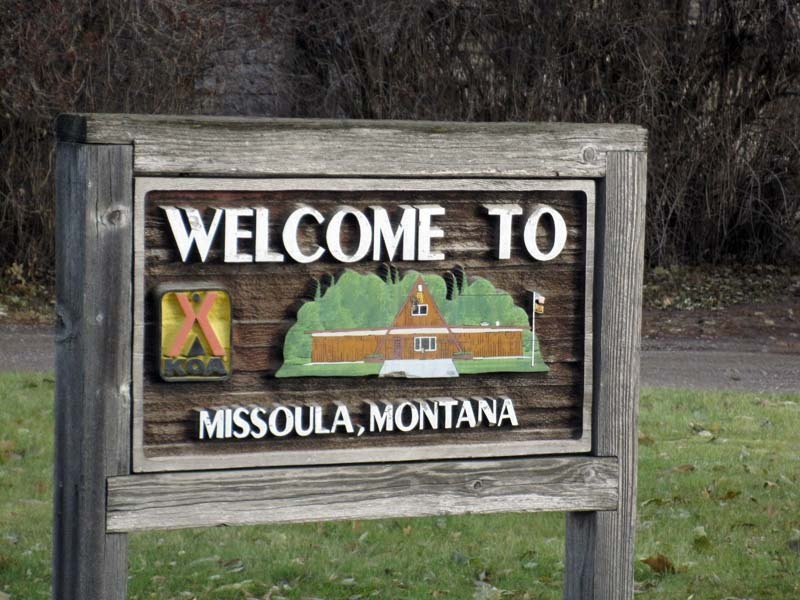 The zip code here in Sula Montana is 59871. 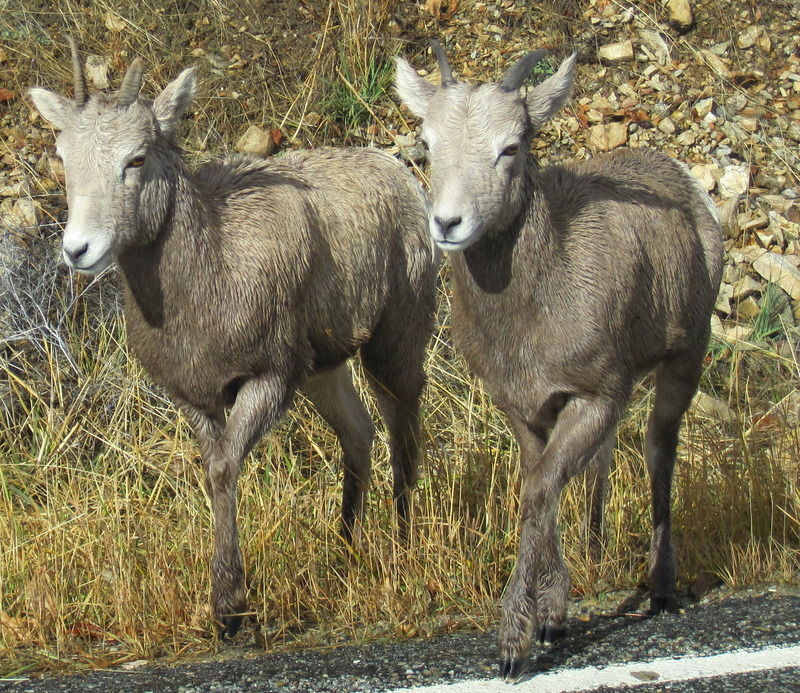 As we approach our camp (Martin Creek Campground) there are some Bighorn Sheep on the road. 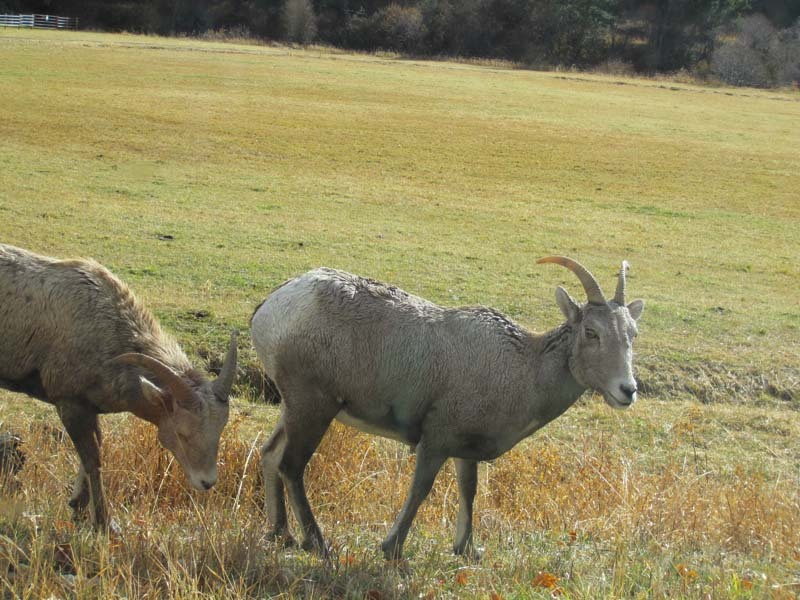 More Bighorn Sheep. These look young (lambs). 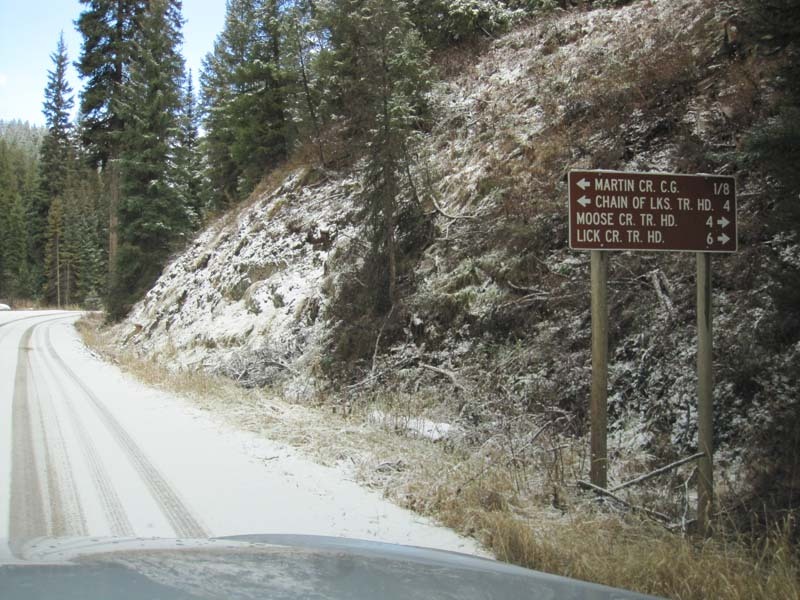 Snow on the ground as we head into Martin Creek Campground, about 16 miles outside of Sula, Montana. Here we are turning into the Martin Creek Campground, Bitteroot National Forest, Montana. 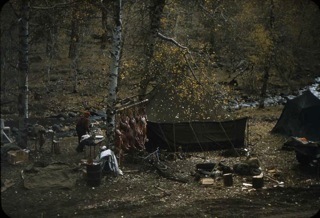 Setting up camp, that's Bruce on the left, Steve in plaid on the tent, and Chip on the far right. Bruce assembling the center pole. Almost all setup. It doesn't have the stove in it yet. 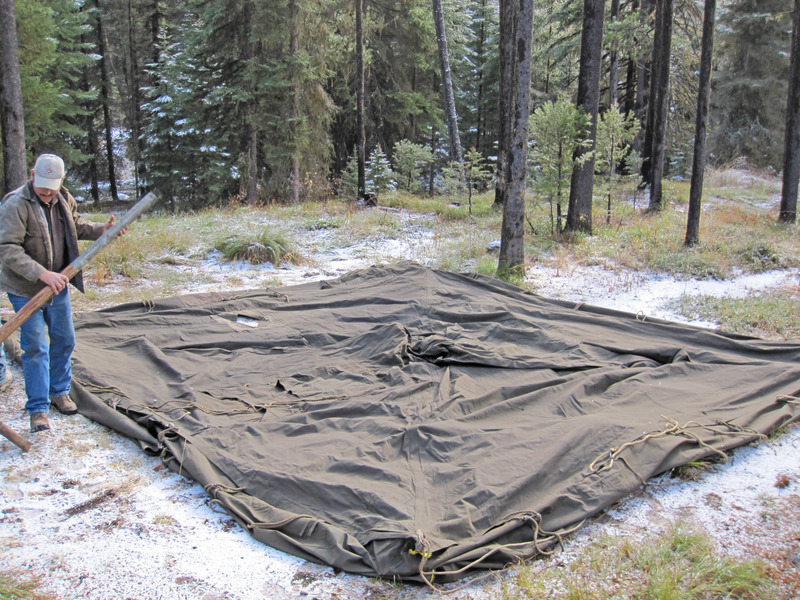 We have always setup in this exact campsite, but there are maybe 8 or 10 spots to choose from. 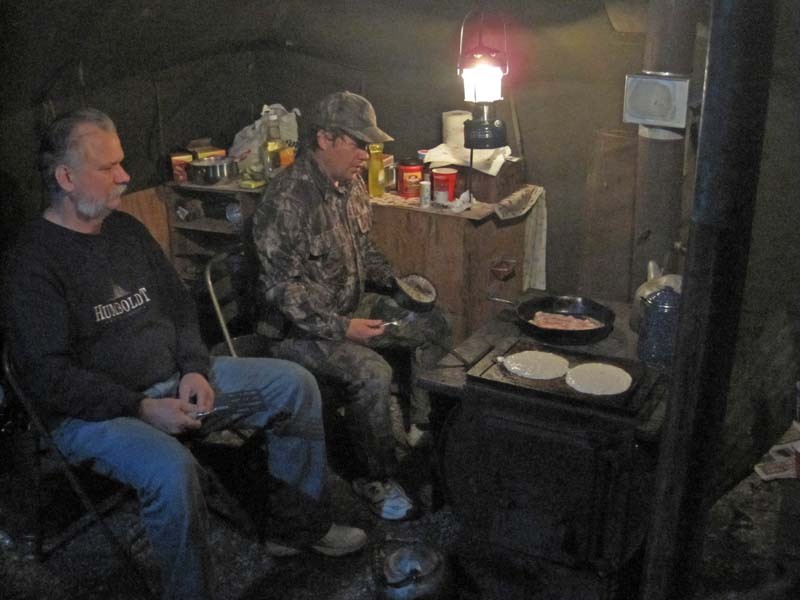 Steve and Chip take our deer to Hamilton to be processed. 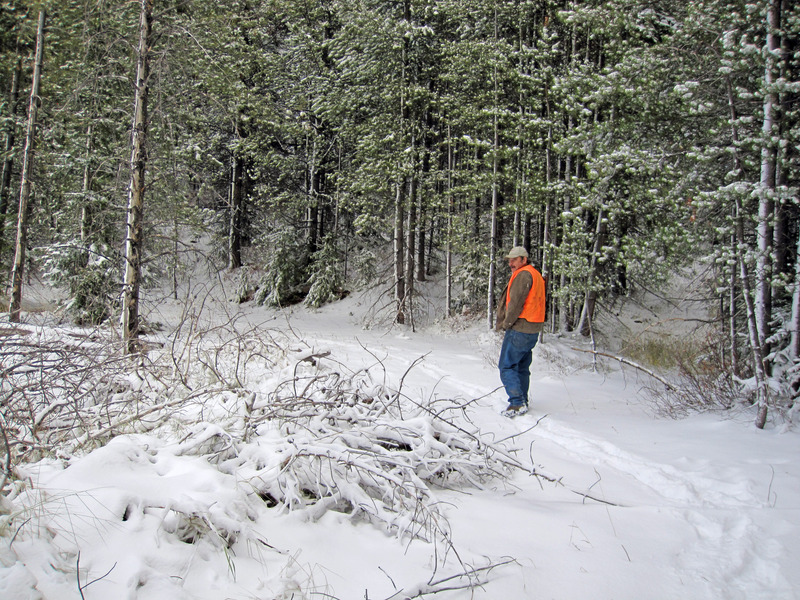 Meanwhile Bruce and I take an hour to cut some firewood and go on a short elk hunt. 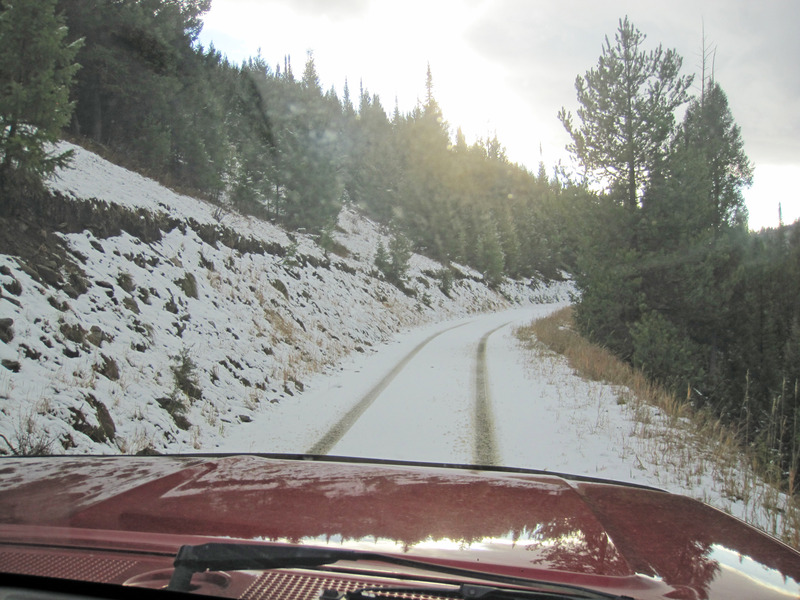 Here we are driving up the logging roads to the trail heads. This is the Copper Creek trail head, but it's most close to the top of Lick Creek (it's a good hefty 2 or 3 mile hike to Copper Creek from here). Bruce really likes Copper Creek and this area. 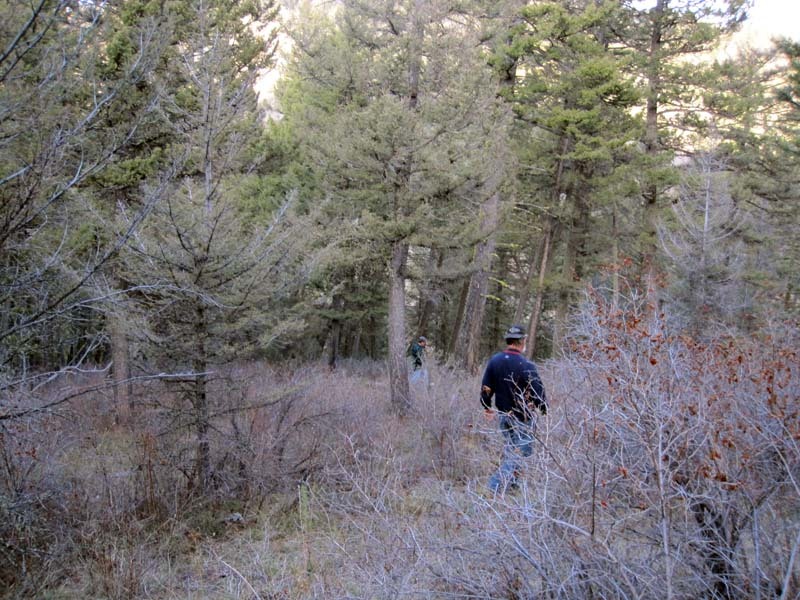 Here we take a stroll to check out the area for tomorrow's hunt. 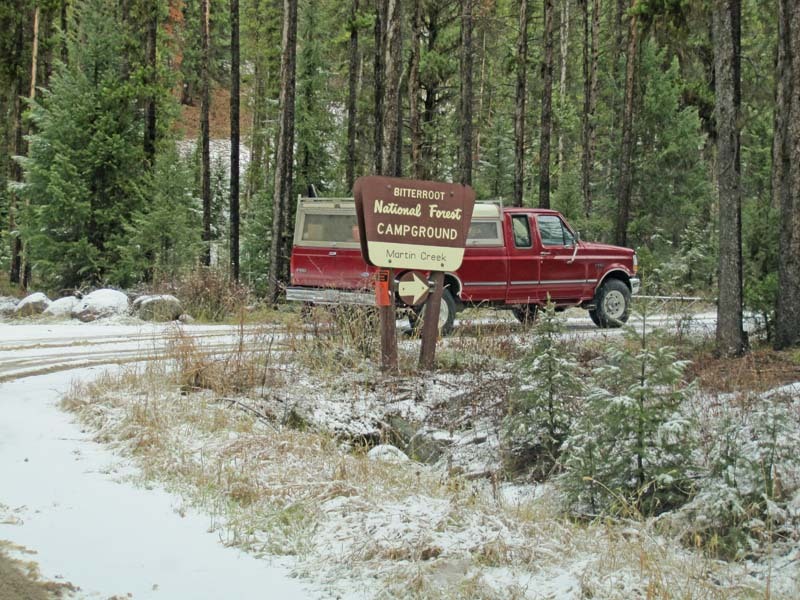 It is VERY pretty here, with a few inches of fresh snow so we'll be able to see fresh animal tracks if any elk are in the area. Bruce walking along with his rifle slung. Here we are at the center of what I call "Reynolds Creek Bowl". 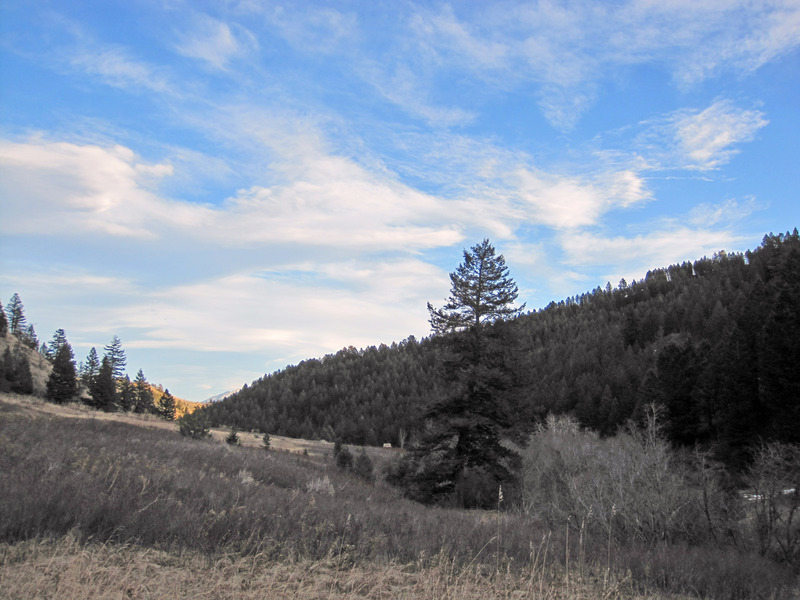 It's not along the Copper Creek Trail, but along a closed logging road that is no longer maintained. 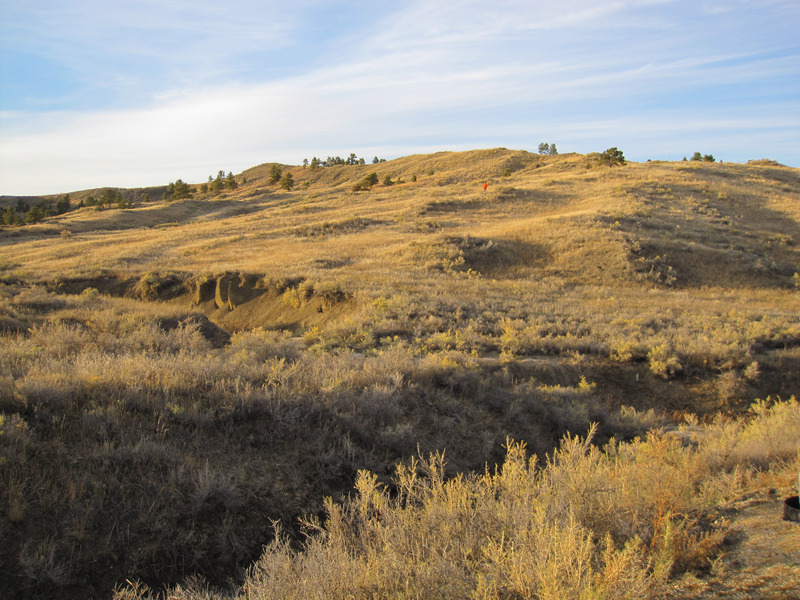 We've seen elk in and around here in previous years, and it's a short 15 minute walk from the parking area so worth checking out. 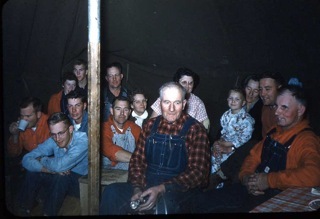 Below are some old family photos of the FIRST generation in the tent. 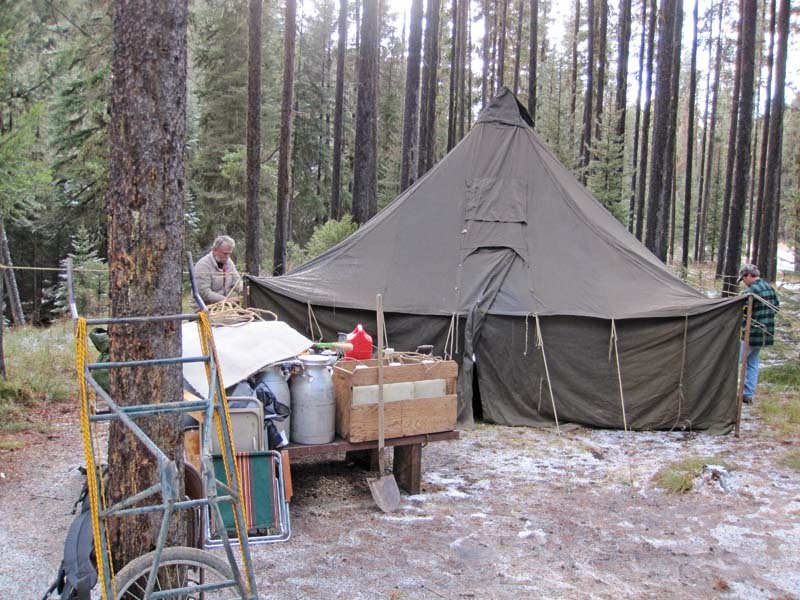 The tent was bought in 1945 as World War II surplus. 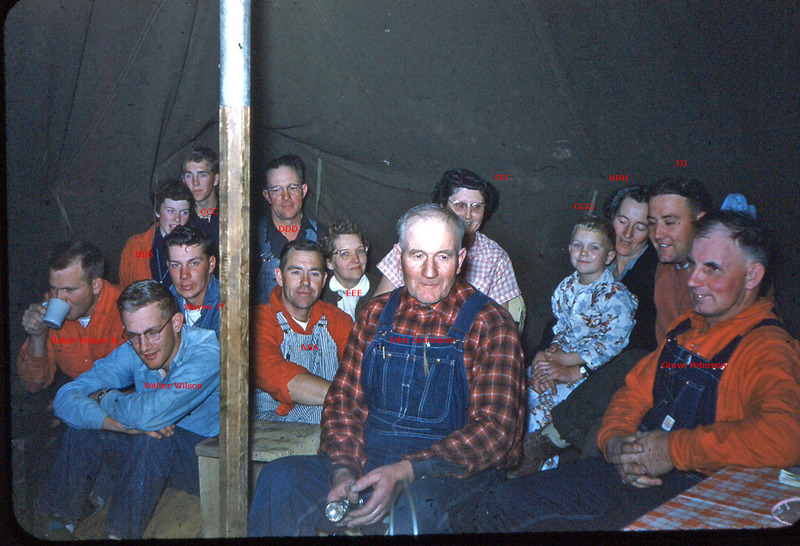 These pictures are of "Deep Creek Hunting" before 1956. SOME of the pictures below can be clicked on for larger versions! This picture confuses me. 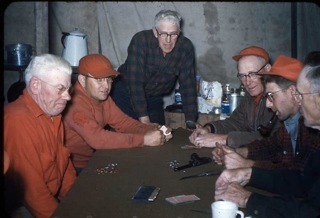 It looks like a card game, but there is a hand-gun and knife on the table. In the picture below Bruce is on the left peeling potatoes for dinner, and Austin Linder is on the right. At breakfast the next morning, I'm heading home but the rest of these guys will hunt for a few more days. From left to right that's Chip (Ralph Wilson 3rd), Steve, Bruce, and Austin on the far right. The picture is stitched together from two pictures but is pretty accurate and the two pictures were taken one after another. 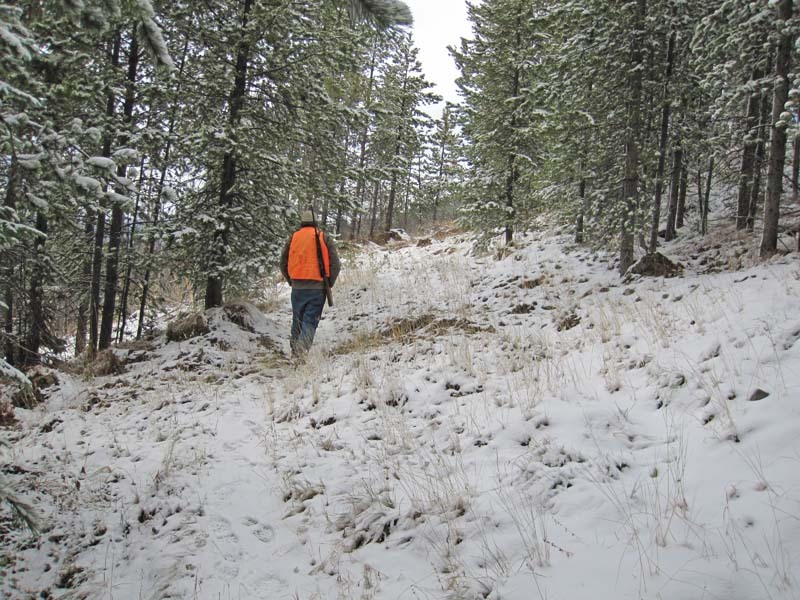 On of my favorite elk hunts is up this trail. 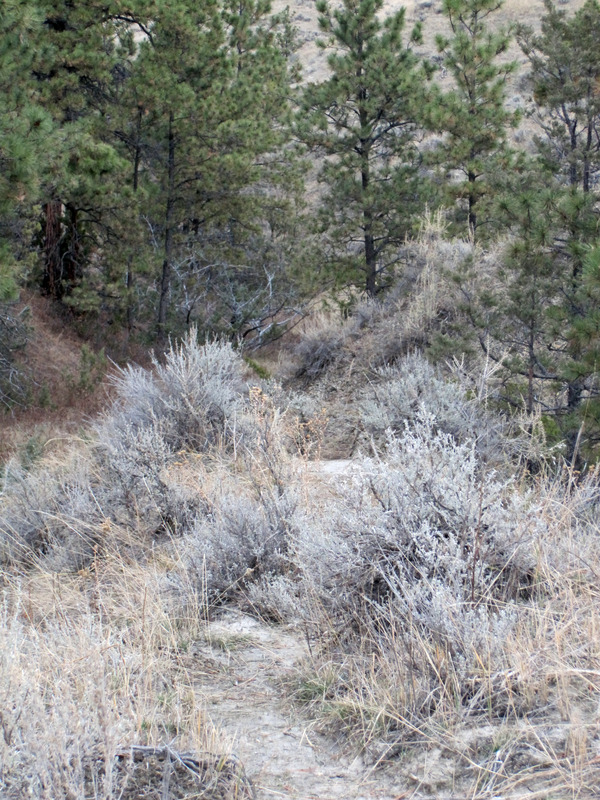 It's Sign Creek Trail which seems to be "Trail Number 40". Click here for a picture of the hike 5 hours from this point at the TOP of the hill from 6 years earlier. This is by the Clifford Creek Trail. 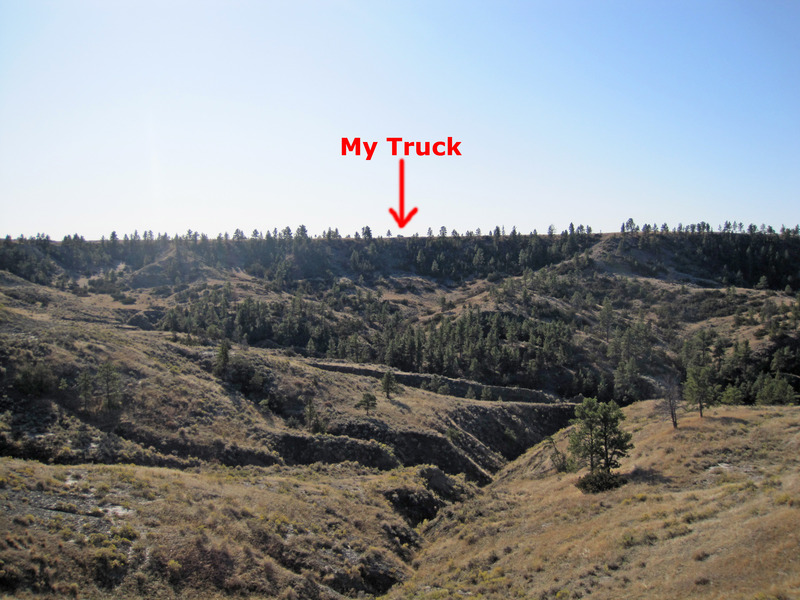 The trucks are parked closest to the top of Reynolds creek, but the trail head is to "Clifford Creek" and heads up over the hill to that area, we also call this "Bruce's Valley" since it's one of his favorite hunts and he has chased lots of elk in that area. 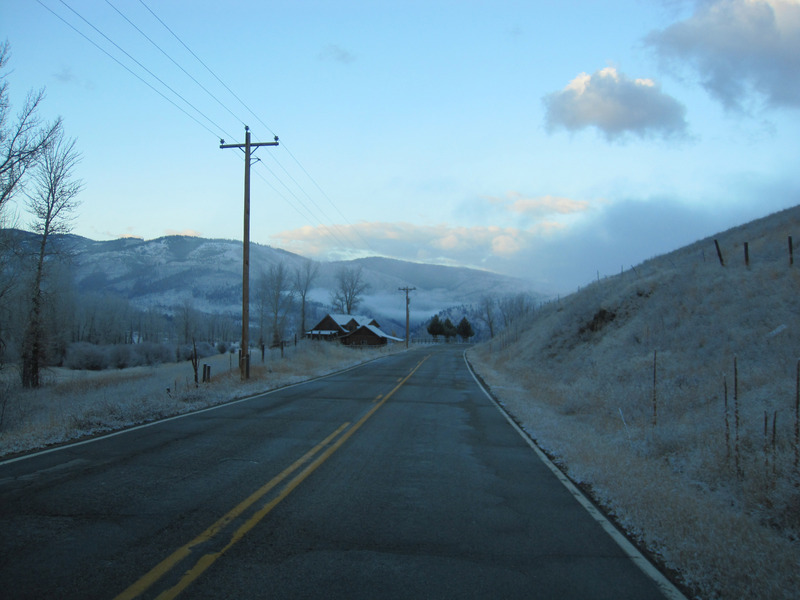 Heading back out of the elk hunting grounds towards Sula, Montana, then later onto Missoula the dawn breaks as I drive out, it is very pretty. 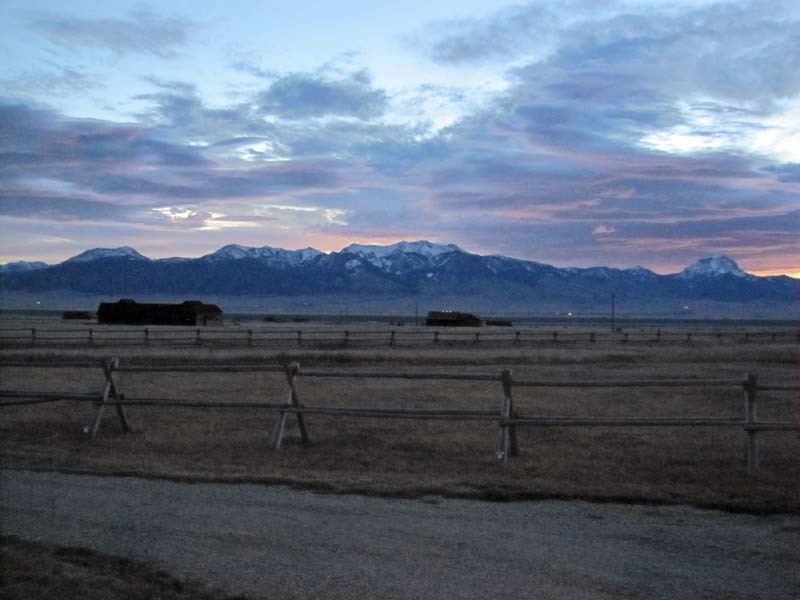 As the sun comes up I head north 2 hours to the airport in Missoula, Montana to fly home. The Bitterroot mountains are very pretty in this area just outside of Sula. 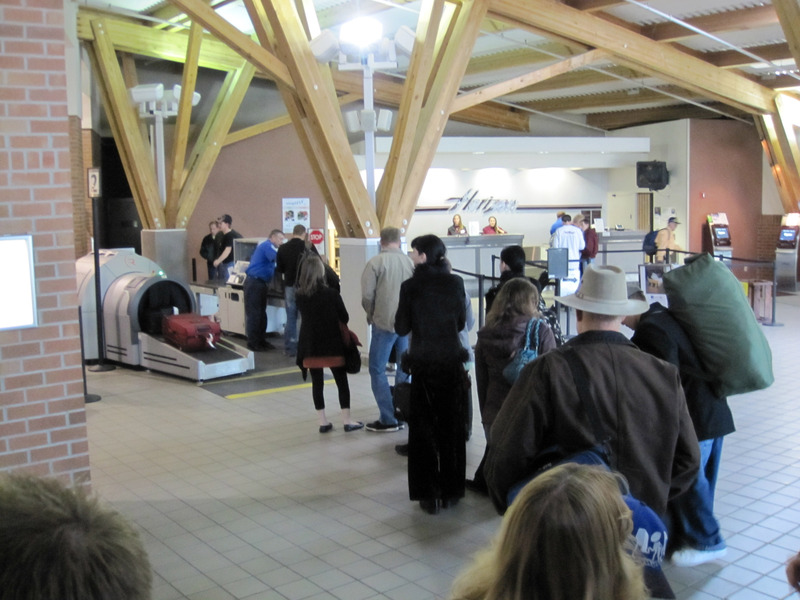 My bags are packed below, sitting in Missoula airport. 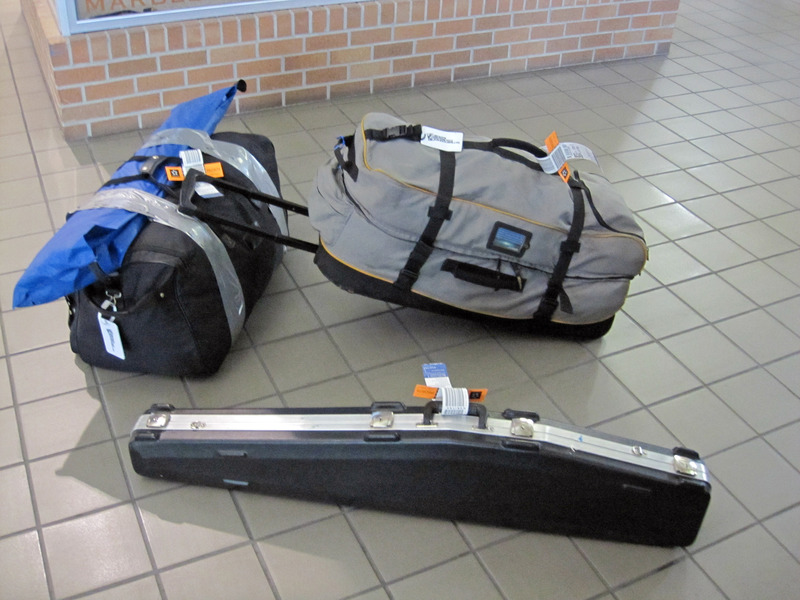 That's a gun (rifle) case and two big bags. The blue thing is my cot duct taped to a bag to make it one bag. 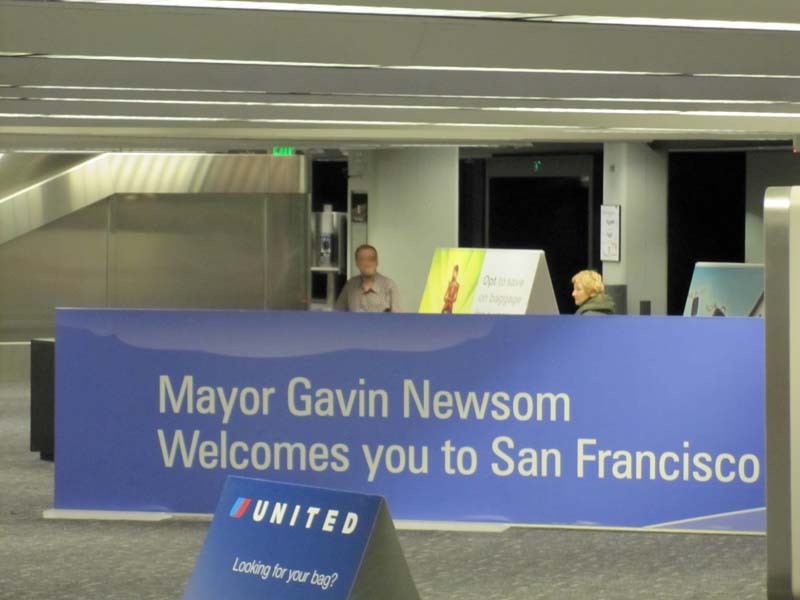 Finally, after a full day of traveling, here I am back here at home baggage claim (Mayor Gavin Newsom welcomes me home which is nice of him :-). 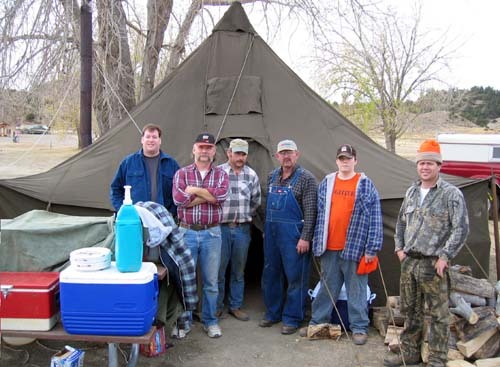 Need a few new great tent stakes for tent corners in high wind - Burning Man style rebar maybe? Need 20 inch lengths in size #4 (which means 4/8" or half an inch in diameter). Need to bend the top tip rounded (candy cane), use two pipes 4 feet long slipped over ends. Failed last time, try harder -> 8 inch long "bic style" lighter for white gas lamps, tired of stupid old fashioned matches. Clean out large camp tea pots used for heating water for hand washing and dish washing. Sand blast? Very rusted. Does cot really have all its feet? Need a new cot? Invite Nathanael and Mark Hoffmann, might be interested.